I recently found out about this section of the forums (I have only come here for patch notes before) and it inspired me to make some of this concepting stuff myself. 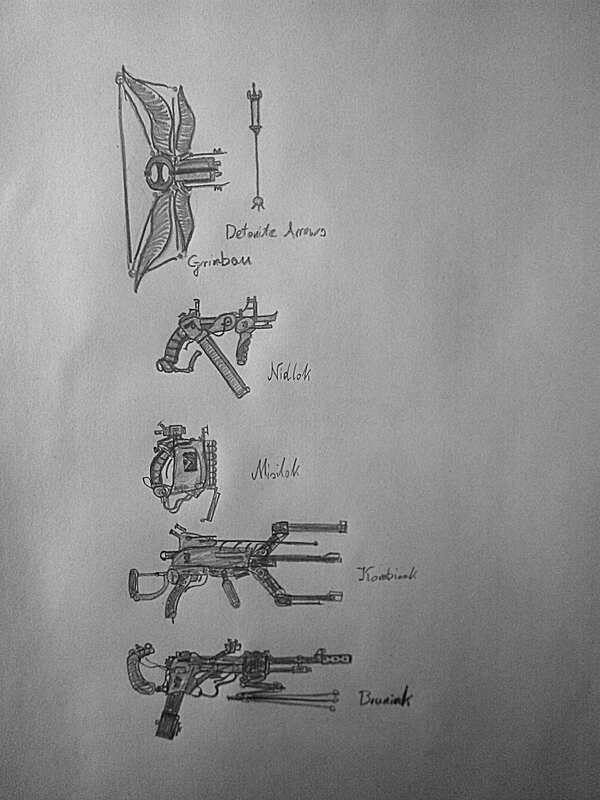 But, instead of making a new warframe or weapon, I decided to add some things to my favourite faction in the game (spoiler: It's the Grineer). This is going to have 3 (maybe more, who knows) parts. I'll go until I have no more ideas, strap in bois. 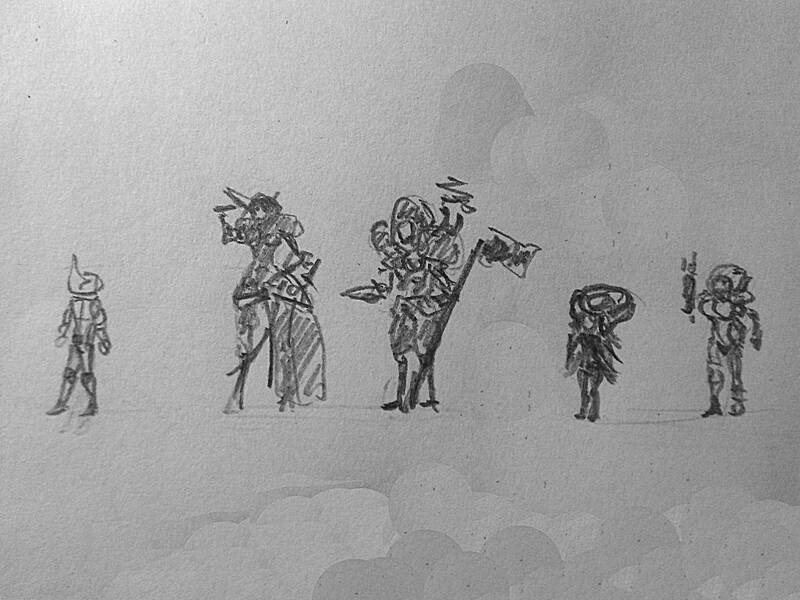 In each of them, I will create concepts for new units, bosses, lore and event-like stuff. 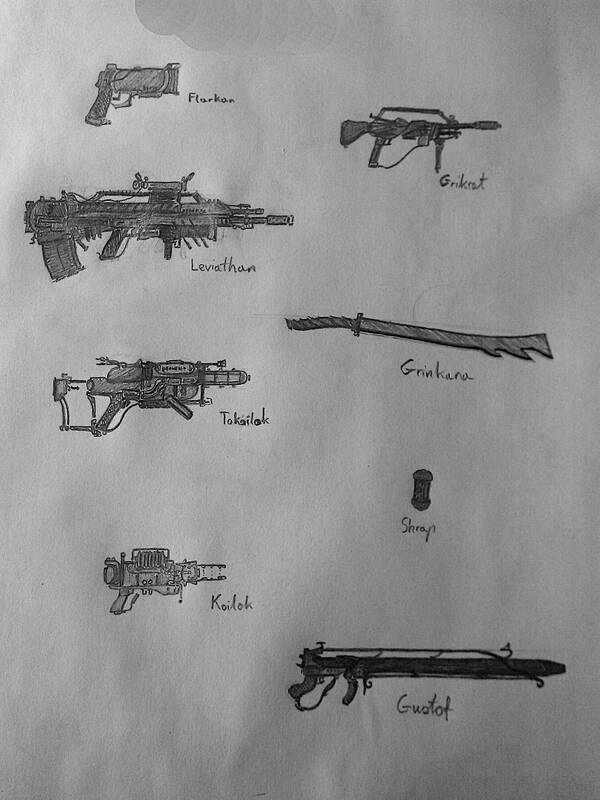 Okay, I'll make some weapons as well. Disclaimer: All lore that doesn't go with official materials or outright changes/removes canon is made like that on purpose. This is NOT supposed to be canon in any way, I am effectively making fanfiction here. Everything should be considered my headcanon, I do NOT make these concepts to be realistically put into the game. Small, but potentially important note: This thread is best viewed in the default (light) forum theme. I am aware of several things that might be harder (or maybe even impossible) to read/see when using the dark theme. I simply can't be bothered to keep the topic up to my admittedly high standards in both themes as it would require way to much menial work (As this is a "for fun" project, I thinks it's understandable why I don't want to do things I consider "unfun"). Since the thread has become pretty sizeable, I decided to make a working table of contents, full of links for reader convenience. If you wish to follow the story as it was made, you are welcome to read from beginning to the end. Alternatively, use the Chronological List. If you are interested in a specific topic, or wish to read everything in a more cohesive, logical way, use the Thematic List. Additionally, I have a small, "miscellaneous" thread with bonus ideas. While those are generally way less "grandiose" than what you'll find here, I do consider them as "in-game" for the purposes of this thread, so if something doesn't make sense, it might have been mentioned there. Link: Click here. 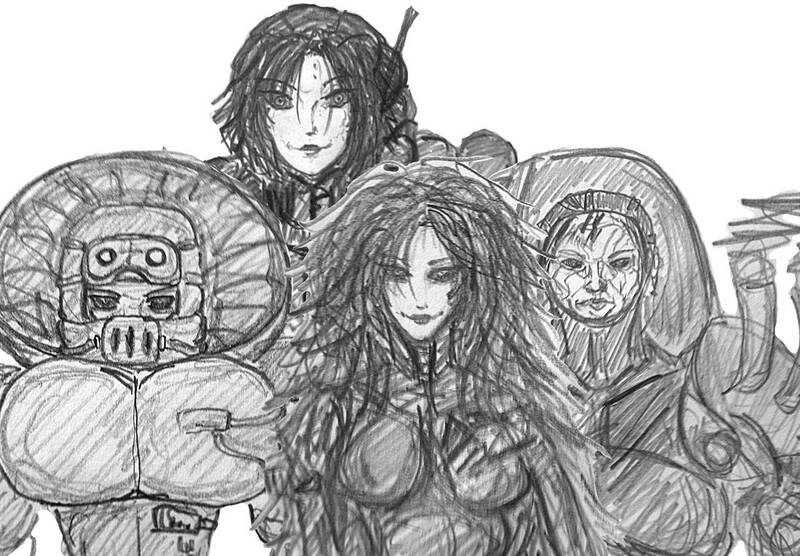 After the fiasko of the Balor Fomorians, Vay Hek lost much of his foothold in the Grineer Military Council, even the Queens have shown their displeasure with his failure. In official materials, it's Tyl Regor who has been given the authority over the future offensives. However, this is where my concept will diverge from canon. 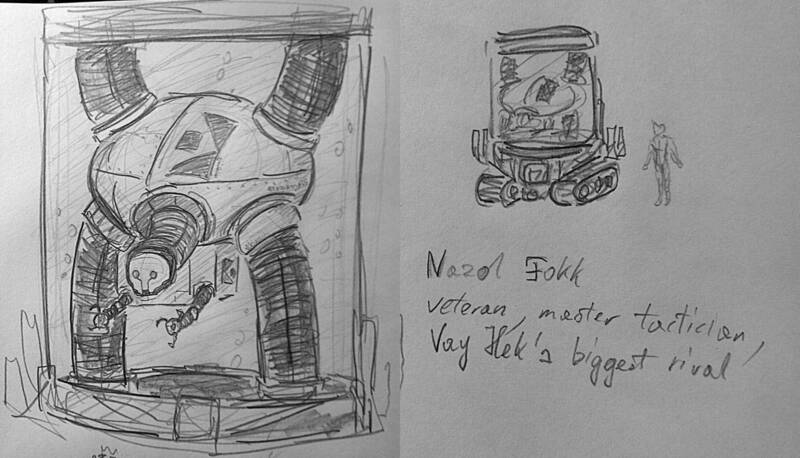 Enter Nazol Fokk, one of the oldest Grineer generals and, conveniently, Hek's biggest rival in the Council. There is a saying that "opposites attract each other", then I guess it is normal that Nazol and Hek are sworn enemies. 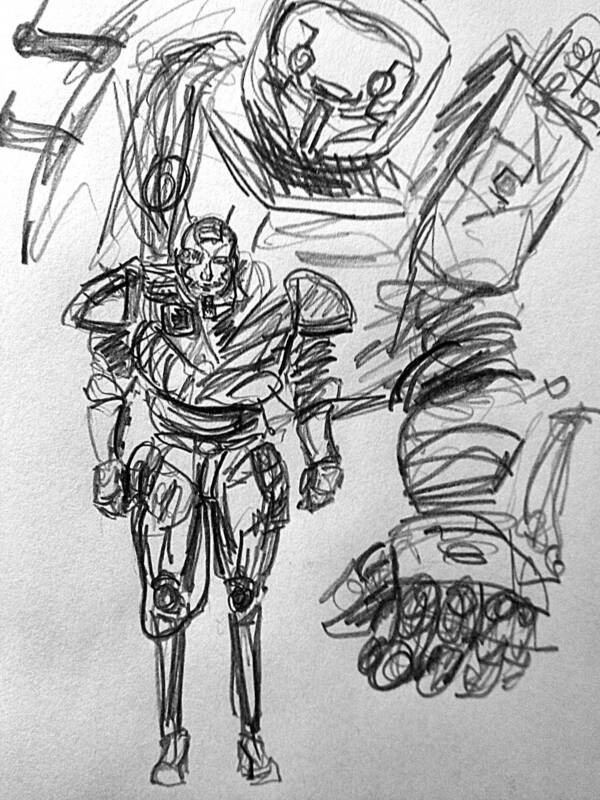 They are very similar, both in their background and in their heavy use of augments. One thing divides them, however. 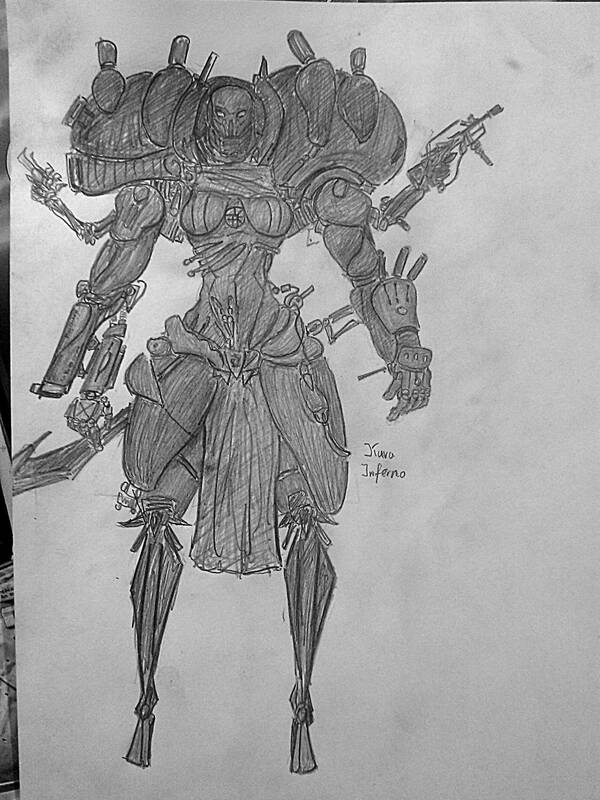 Fokk is a traditionalist, where most Grineer officers would like to use the Tenno, he would like to destroy them all. He's deathly afraid of them. When Hek started losing power, Nazol was the one who took over. His great intelligence and independent thought, results of a mistake during the cloning process, let him quickly subjugate the Council. 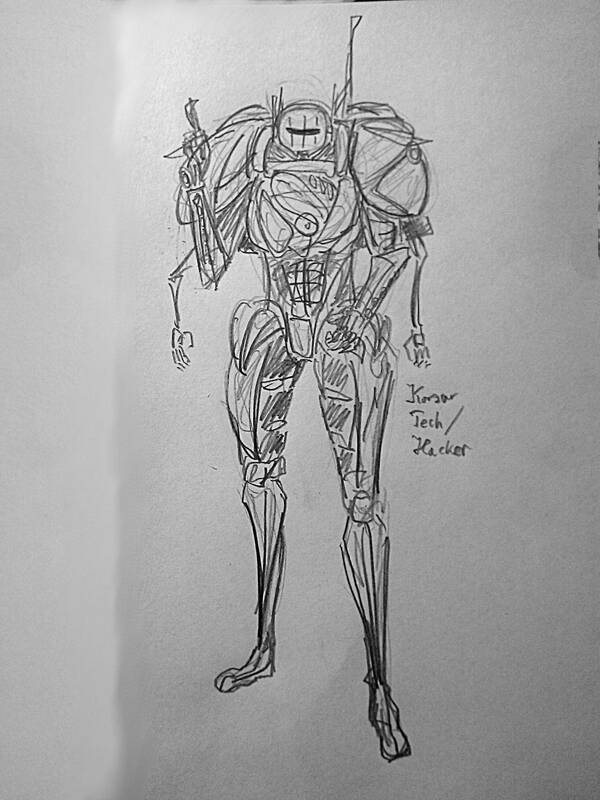 This old, veteran Grineer is only alive due to double-redundant life support systems, specifically crafted for him by Tyl Regor. But while his body might not be in combat-ready state, his mind is more than enough to completely outpace most of the Grineer. 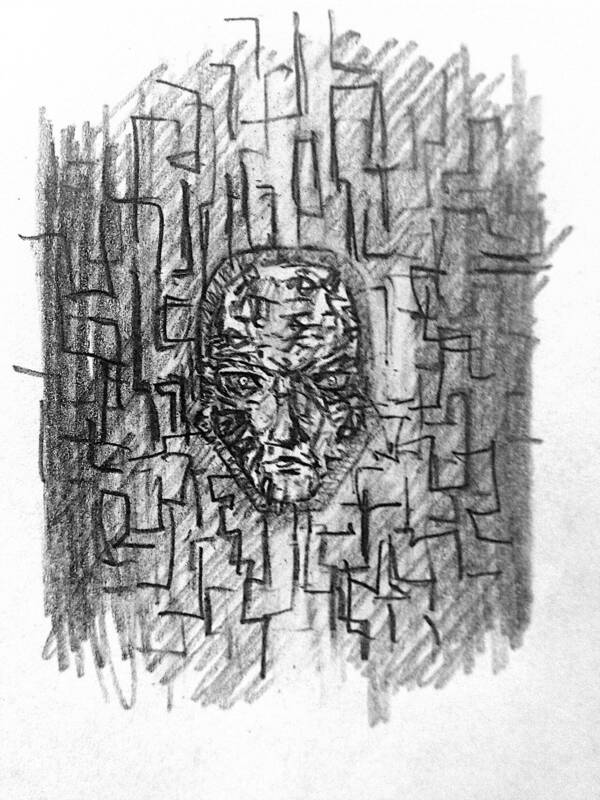 He's a mastermind-in-hiding even moreso than Hek. 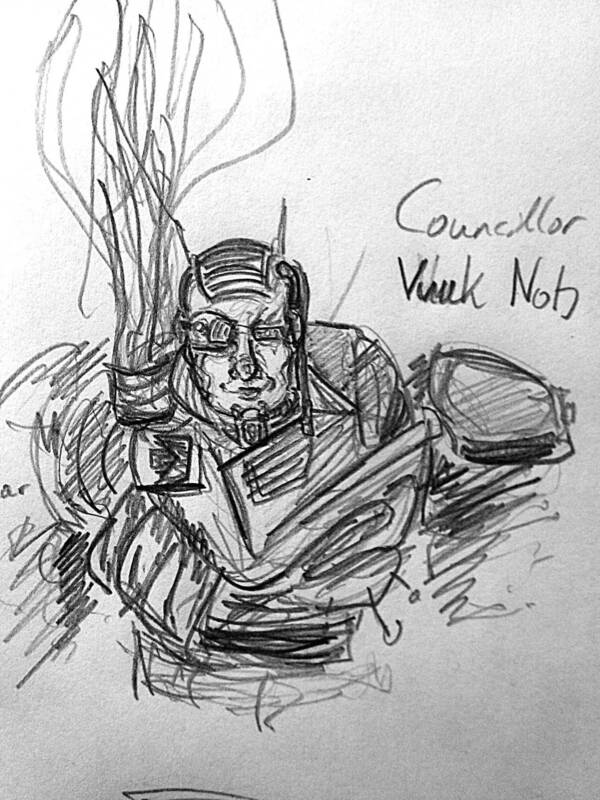 First thing Nazol did with his power, was promoting a young, aspiring Grineer, named Vuuk Nob, as his right hand assistant. Vuuk is a similar freak accident, capable of critical thought and, more importantly, innovation. Thus, after the failure of the Fomorians, a new operation was planned. "Grineer technology is not enough" Nob decided "We need to gain understanding of corpus tech to advance ourselves". This was approved, as a lot of generals considered a more open conflict, or even a flat-out war with Corpus a possibility, after Hek decided to assault them with his Balors. This was the beginning of the Shadow Marines. An elite dispatchment of Grineer soldiers, specifically cloned, trained and equipped to deal with Corpus. 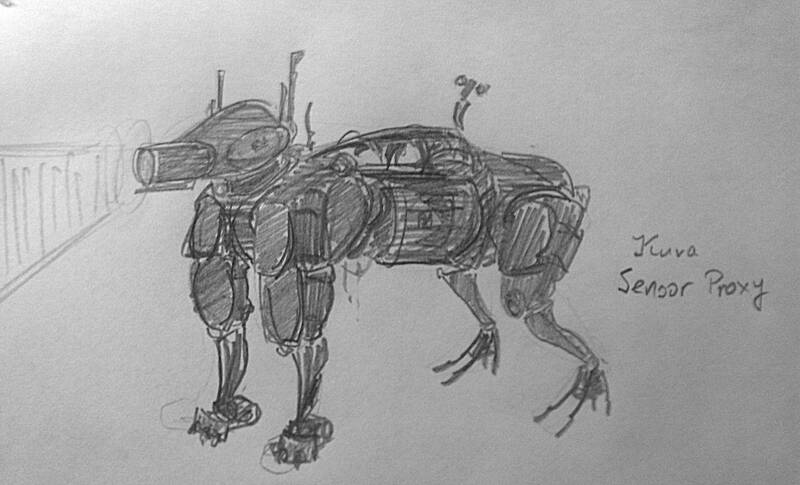 Their mission: to stealthily board lone Corpus vessels, then comandeer them and take them to Ceres for "deconstruction". Their existence shall be always denied and Corpus ship losses explained as "Tenno attacks" or "increased pirate activity". 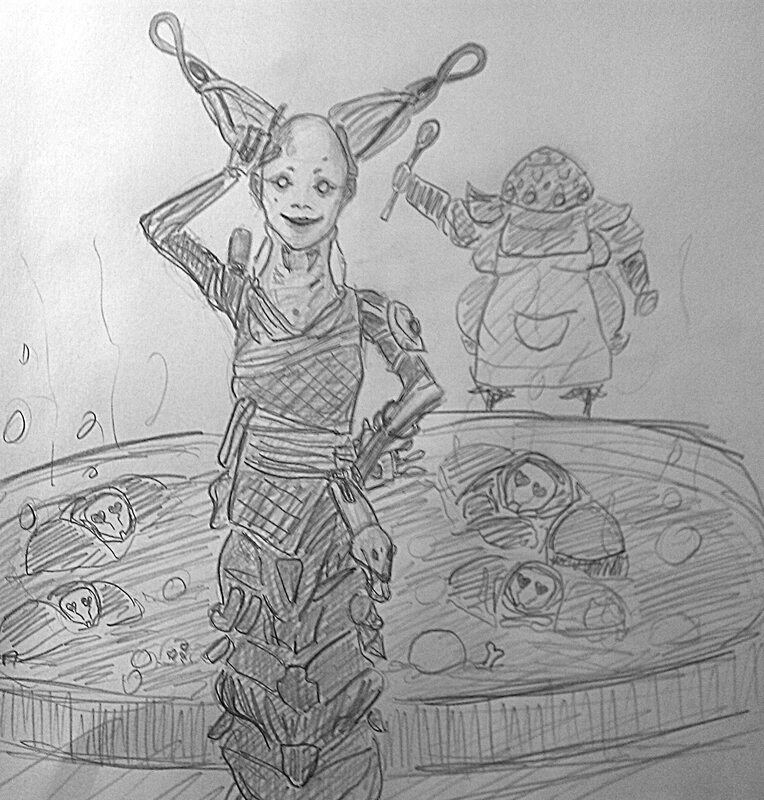 The Worm Queen was promised a "completely new type of protein slurry, with a unique, Crewman taste" and so she happily agreed to the plan. Vuuk had an additional, hidden agenda, however. He wanted to find a way to contact the Tenno. From the moment he barely survived a Tenno attack, he became obsessed with them. He thought: "Tenno are the perfection of war, Grineer must become that same perfection". 1. The planet (not the mission) needs to be under a Grineer offensive (invasion). They will not appear if it's the Grineer who are defending. 2. The player needs to have completed the War Within cinematic quest. 3. 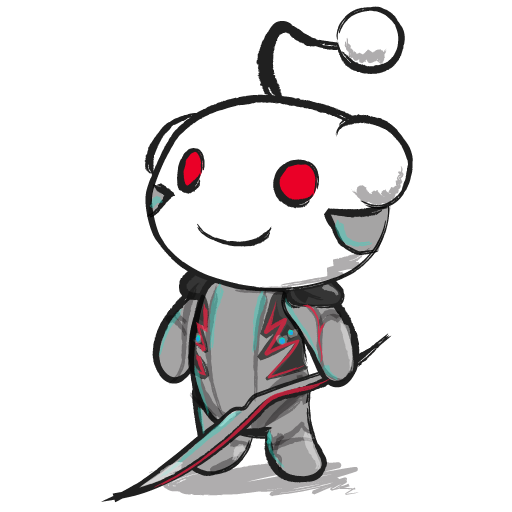 The player needs to start a mission on a node featuring Corpus Ship tileset or Corpus Archwing tileset, that does not have any Grineer presence (meaning: not an invasion node, not a kuva siphon/flood node). These guys work as a stealth team, other Grineer would blow their cover. If these conditions are met, the Korsar units have a high chance of spawning during the mission. They can and will appear in Corpus sorties (that fit other requirements). Once they are there a few short transmissions will confirm their arrival. Lotus:"Strange... What is that signal? Someone is trying to contact you..."
??? : Oh, the Tenno are also here! Great, this is our chance! ??? 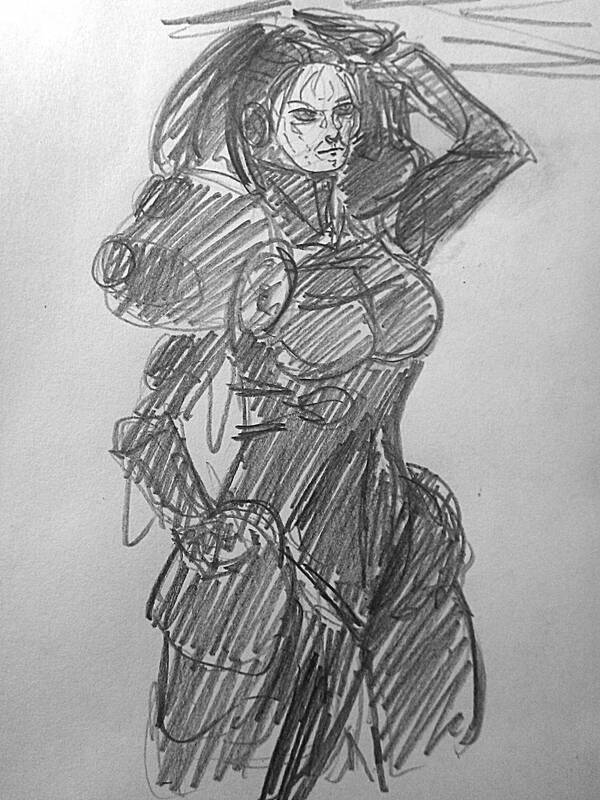 : So, you came to fight the Corpus? Want to team up? We'll split halfsies on the loot. The player will then have a choice, if they attack the Korsars, they will obviously retaliate, but if no offensive action is taken for a short time, they will become allied for the mission. The Shadow Marines always spawn several levels over the average mission level. Due to this, they can be a dangerous foe in higher level planets. The player will get different rewards for fighting them or fighting with them. 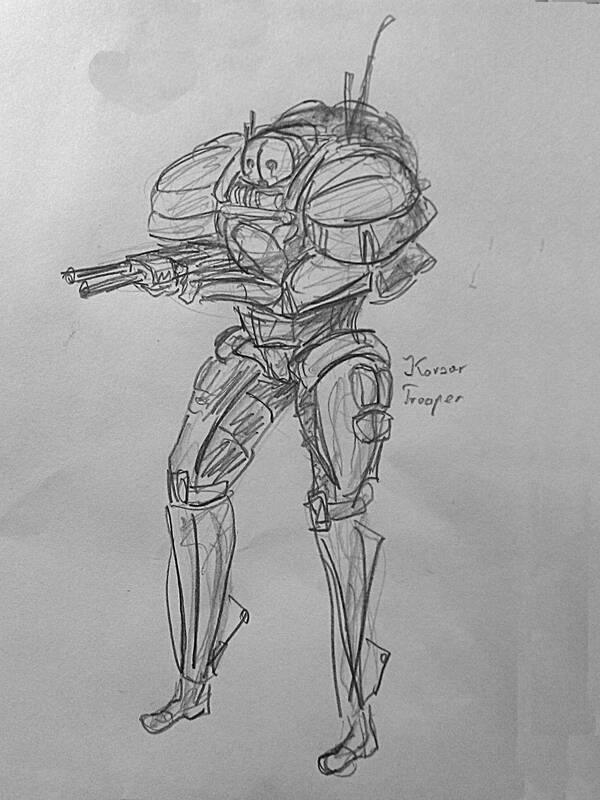 Fight the Korsar and you can acquire blueprints of their advanced weaponry. Help them out enough times and you will gain a blueprint Hrokgar Grineer-made Archwing as well as a Korsar Teleport Beacon gear item blueprint (which allows you to summon the Korsars in any mission, which meets the normal conditions). 1. 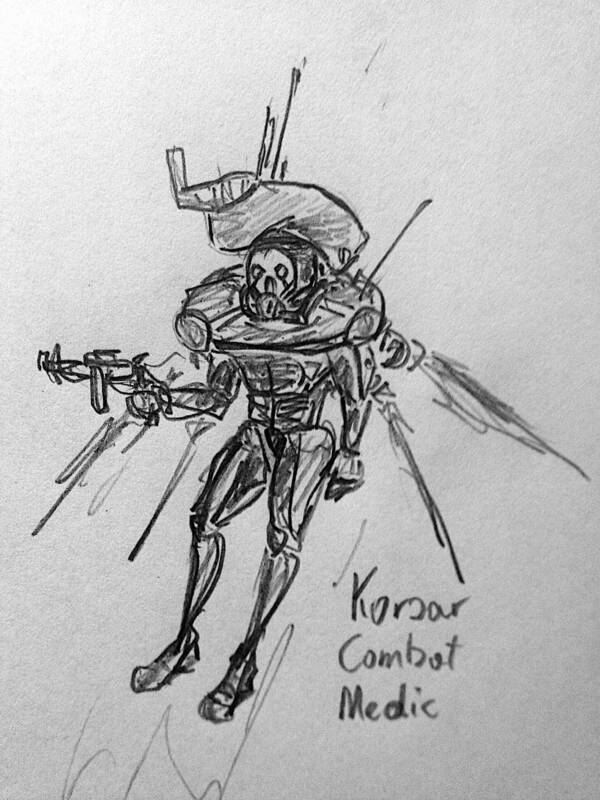 All Korsar units wield a full loadout of weapons (primary, secondary and melee), when disarmed, they will first switch to the secondary weapons (they need to be disarmed twice to switch to melee). 2. 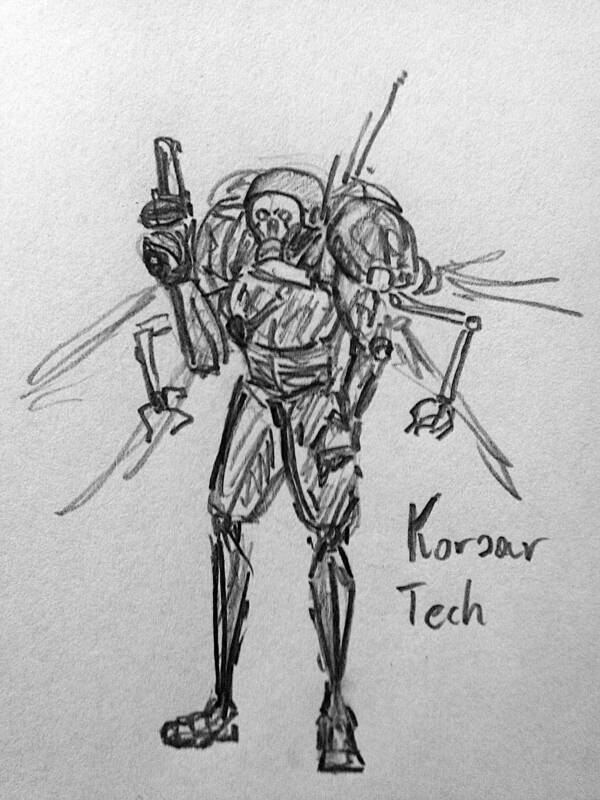 All Korsar units are equipped with Hrokgar Jetpack/Archwing. They can use them even in non-Archwing missions to dash around very quickly. 3. 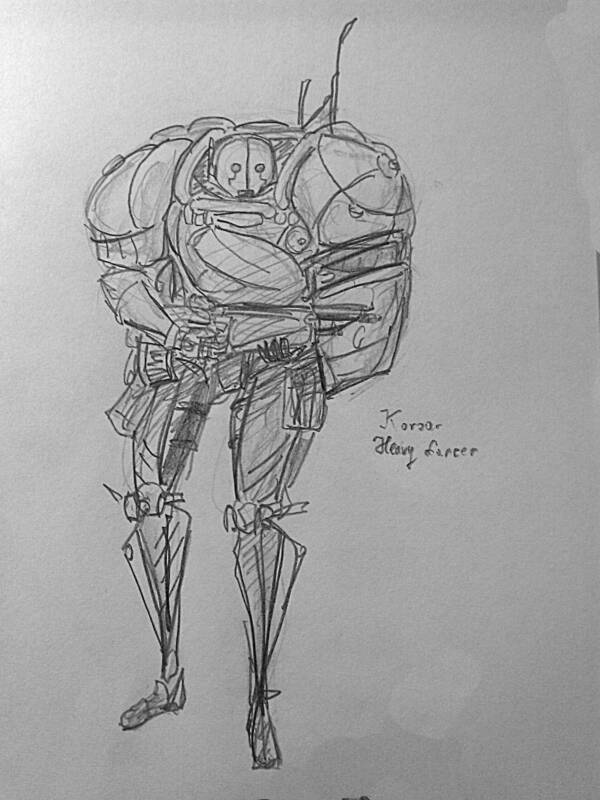 All Korsar units use a new armor class, the Composite Armor. Their health is still the good, old Cloned Flesh. 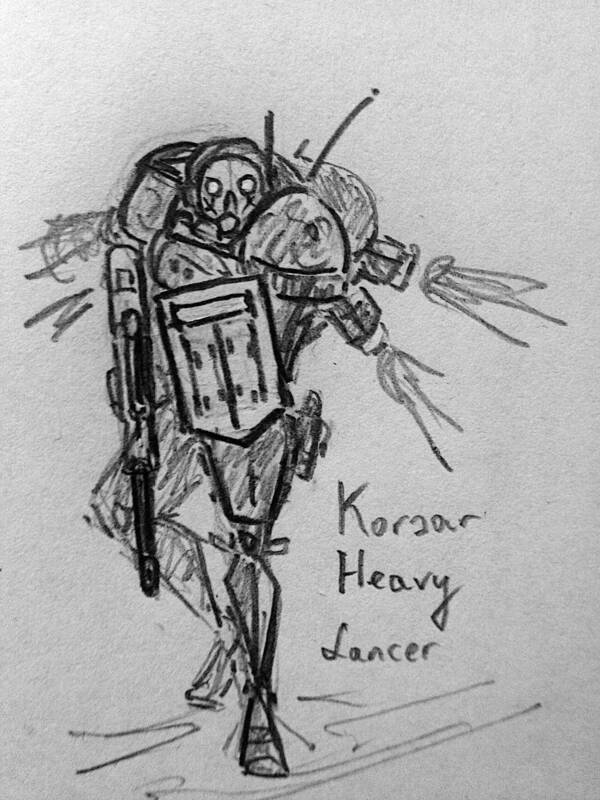 The most common unit in the force, Korsar Lancers are nevertheless not to be underestimated. As a result of different cloning practices, they are able to act more independently and use more advanced tactics. As with all Korsar units, they are equipped with a Hrokgar Archwing/Jetpack, granting them mobility nearly on par with the Tenno as well as granting them the ability to dash around in non-Archwing missions. They will frequently do so to gain a better position over their enemies. 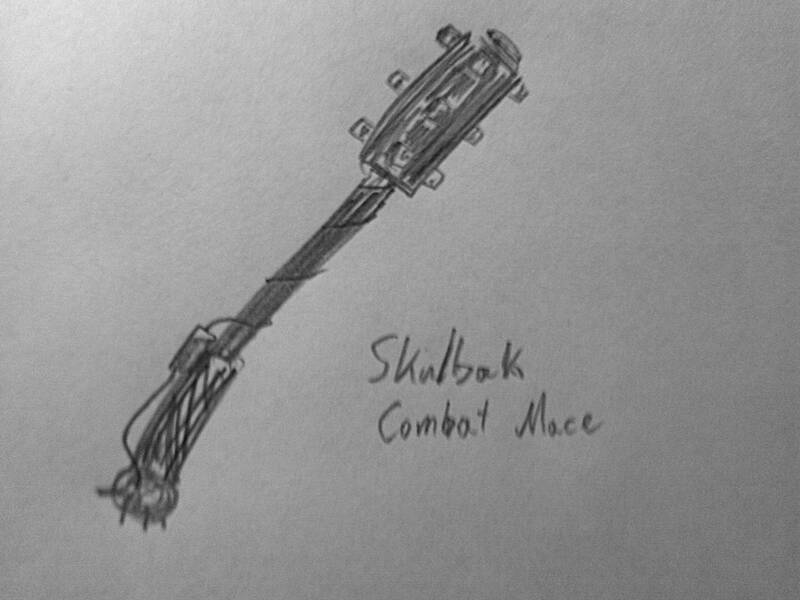 For their weapons, they use the fearsome Voltakk Submachine Gun as a primary and Dwerg Burst Pistol as a secondary, their melee weapon is Skulbak Combat Mace. Movement: Jetpack Dash: Using their Hrokgar Gear, this unit can quickly reposition themselves, gaining damage reduction on certain frames of the animation. Grenade: EMP Grenade: This unit can throw EMP grenades, which detonate after short delay, disabling electronical units and proccing Magnetic status effect on all units in the radius. Heavy Lancers are the tanks of this detachment. These troops feature not only increased armor but are also equipped with a personal shield (physical object, not energy shielding) they use to obscure their head when firing at their enemy (the shield is immune to damage and punch-through). As always, they also possess the Hrokgar Jetpack. Their primary weapon of choice is the Batlok, a heavy Battle Rifle with selective fire capabilities. 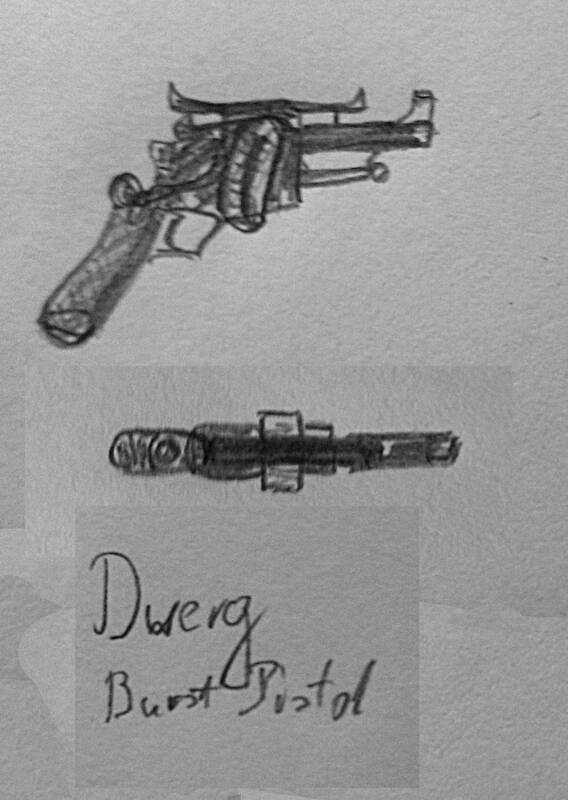 Other than that, they also use the Dwerg Burst Pistol and Skulbak Combat Mace. Melee: Seismic Shockwave: This unit can smash the ground to knockdown all nearby opponents. 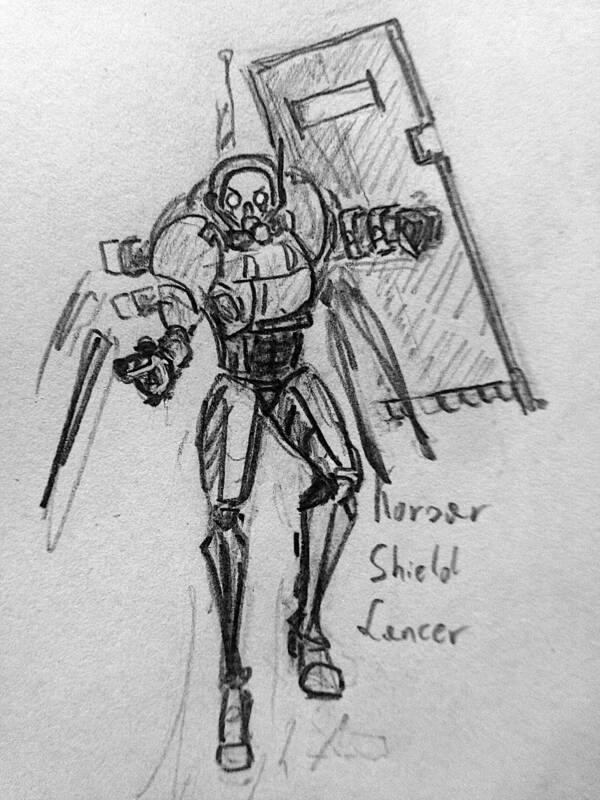 Korsar Shield Lancers have a similar duty to the generic ones found within the Space Marine corps. However their shields are bigger, immune to punch-through and are augmented with powerful strobe lights, capable of blinding nearby foes. These units opt out of using a primary weapon and instead rely on their comrades to deal the damage. They are still equipped with a Jetpack and use Dwerg Burst Pistol and Skulbak Combat Mace. Ability: Radial Blind: This unit can unleash a flash of light that blinds all enemies looking at it. 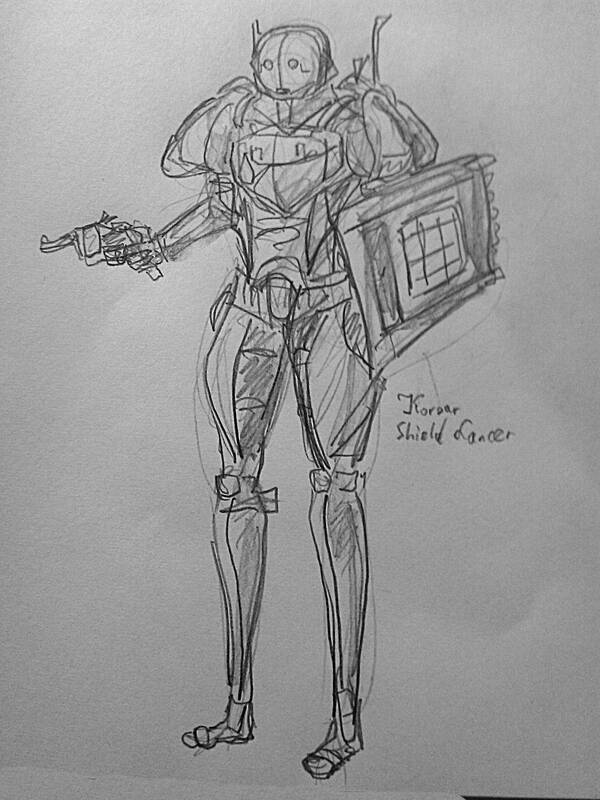 Korsar Troopers are heavily armored CQC specialists. 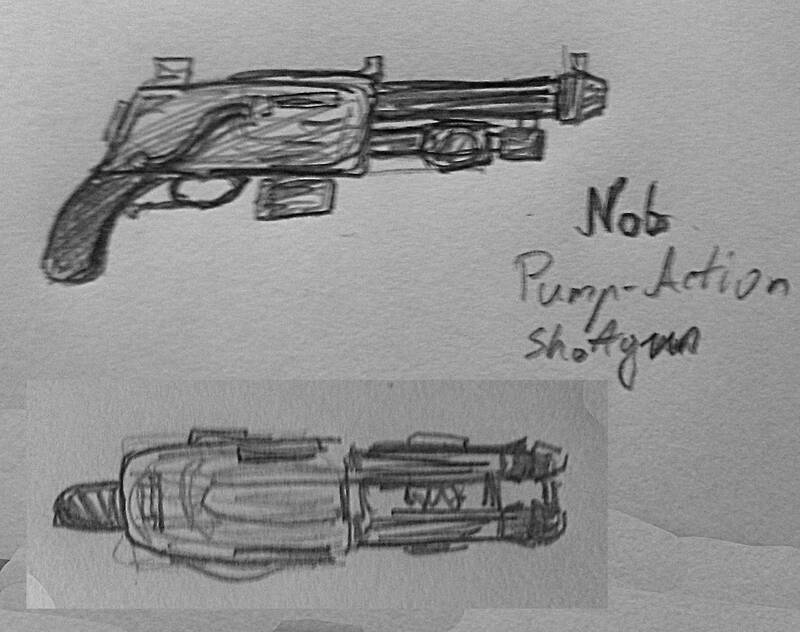 Armed with powerful Nob Pump-action Shotgun, they can deal a lot of punishment very quickly. Their other weapons are the Dwerg Burst Pistol and Skulbak Combat Mace. Their favourite tactic is to dash towards a chosen target with their Jetpack, then blast them right in the face with full 2-barreled fury of the Nob. They are also way more likely to throw grenades and will often use two at the same time. Grenade: Frag Grenade: This unit can throw Frag grenades, which detonate after short delay, dealing Physical damage to all units in the radius. 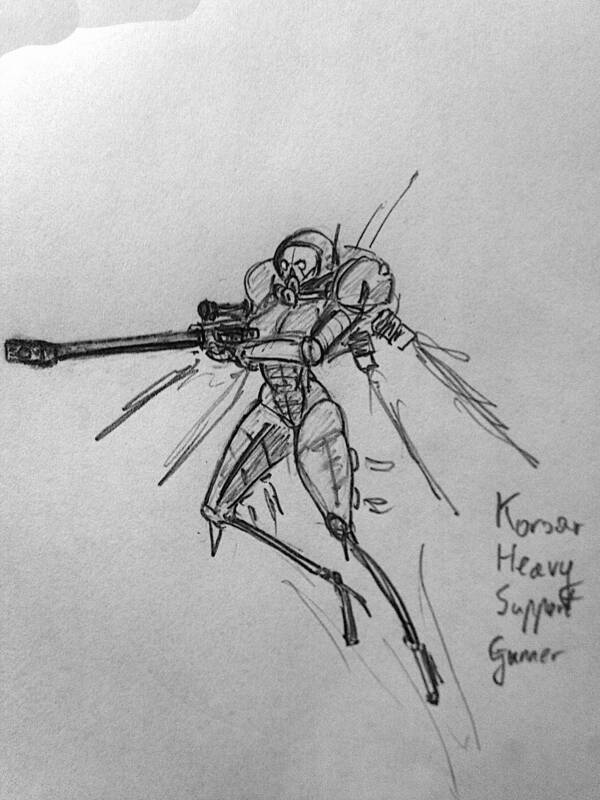 Korsars use 2 variants of the Heavy Gunner unit, the Assault and the Support. Both of them use Kulstar rocket-pistol as a secondary weapon and the Brokk Hammer for a melee. Their Seismic Shockwave can proc Magnetic. Heavy Assault Gunners are the ultimate firepower platforms. They are fitted with very durable armor with embedded Missile Pods and equipped with the Vulkin Rotary Autocannon. With their primary they will often spin-up before engaging the opposition, then charge in with their Jetpacks. The Missile Pods can fire traditional Blast damage explosives or 2-stage - Magnetic-Electric warheads designed to counter Corpus units. Both of these have high status chance. Melee: Seismic Shockwave: This unit can smash the ground to knockdown all nearby opponents. Procs Magnetic status effect. 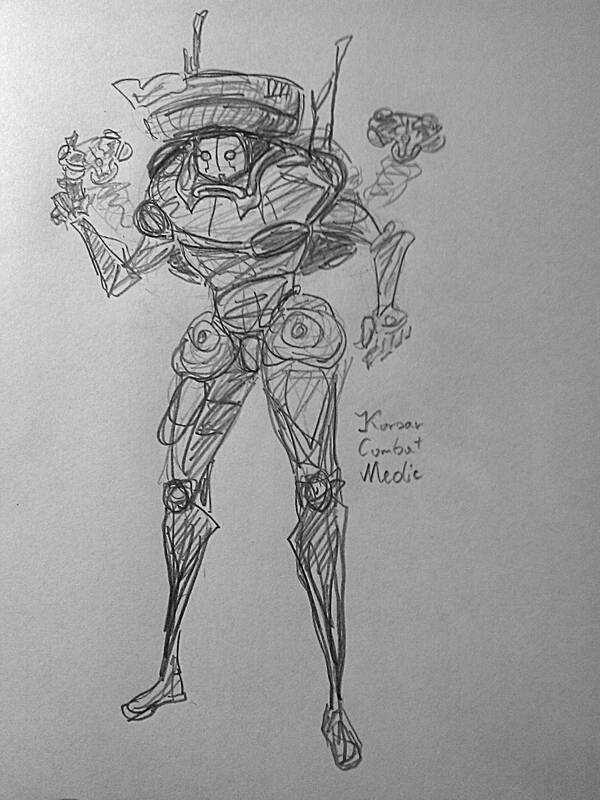 Ability: EMP Missile Barrage: This unit can fire EMP missiles, which home in on nearby enemies and detonate on contact, disabling electronical units and proccing Magnetic status effect on all units in their radii. 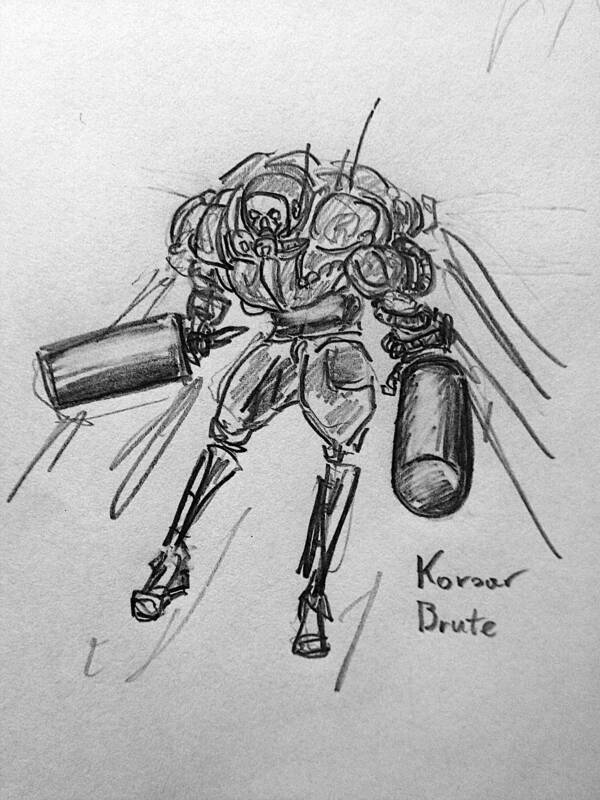 Ability: HEAT Missile Barrage: This unit can fire EMP missiles, which home in on nearby enemies and detonate on contact, dealing Physical damage to all units in their radii. 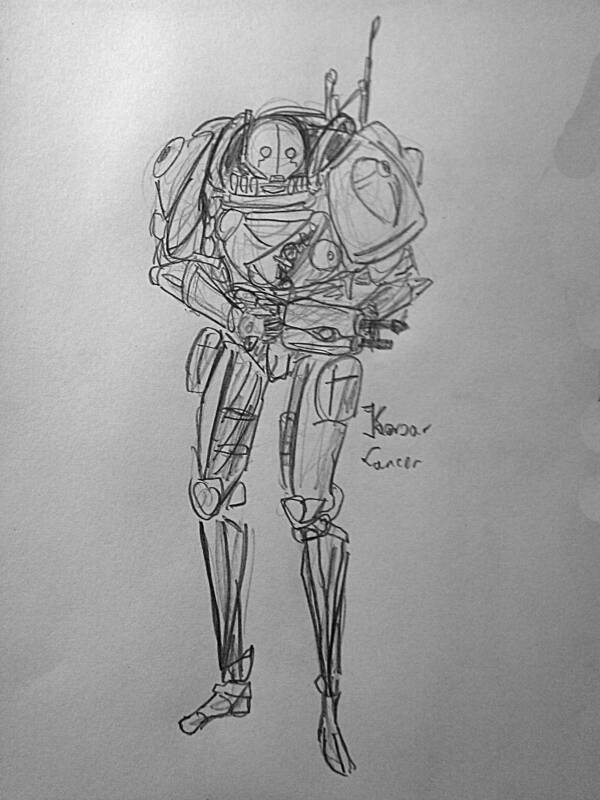 Heavy Support Gunners are dedicated anti-armour units. 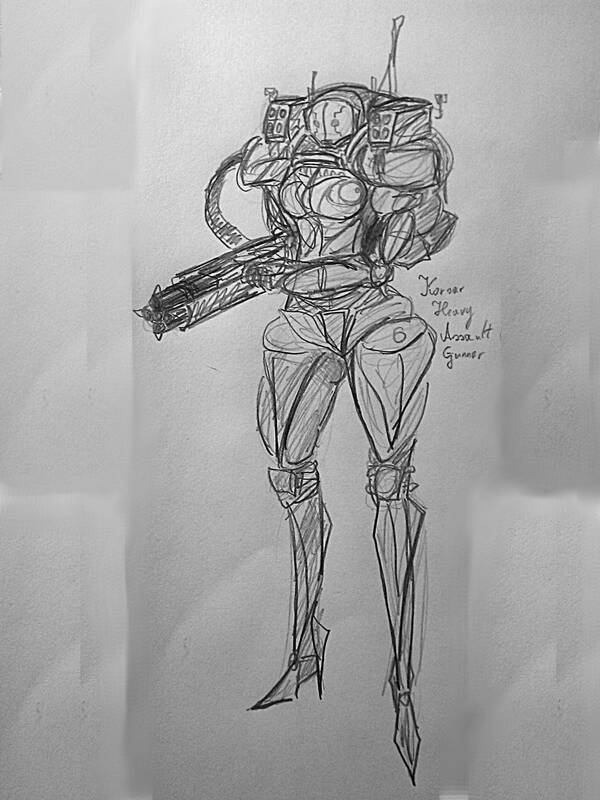 They are often capable of killing enemies like Bursas in one shot with their incredibly powerful Demolok Anti-Materiel Rifle. As opposed to most heavy units, they prefer to stay behind and lock down the enemy from range. You could say they are a heavily beefed-up Balista equivalent. These specialised elites are most often the leaders of Korsar raiding squads. They are equipped with state-of-the-art hacking equipment, allowing them to hack the Corpus consoles just like Tenno do. They will often times turn off the alarm or release lockdowns on Corpus Ships. They can also sometimes attempt to steal data in Spy missions, be careful, however. If you haven't allied with them, they can cause you to lose the mission, as any vault hacked by an enemy Tech is considered purged. They use the Dwerg Burst Pistol and the Skulbak Combat Mace as their weaponry, and will attempt no direct combat, trying to hack as many things as they can. 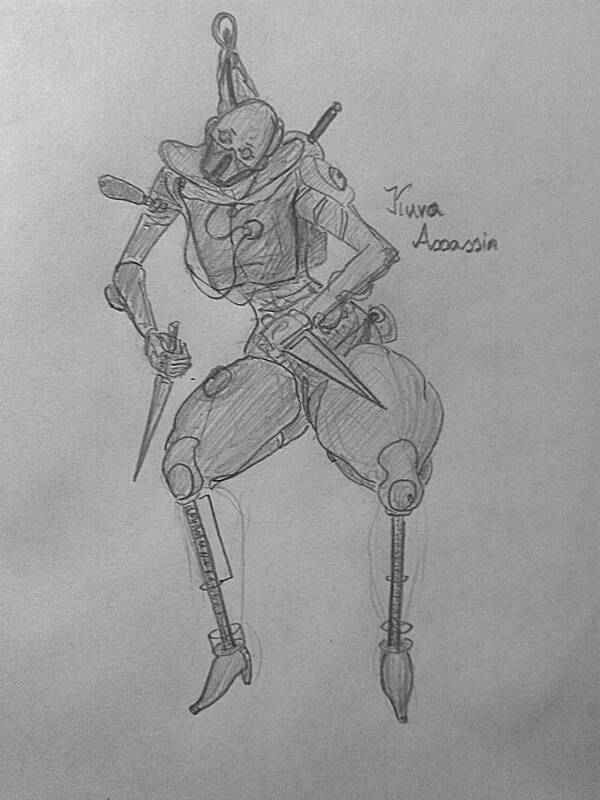 Ability: Hack Systems: This unit can hack any consoles available. While possessing no medical knowledge or skill on their own, these light units carry multiple Medical Drones. These drones will use Medi-Ray on nearby damaged Korsar units until destroyed, however as long as the Medic still stands, new drones can be released. Obviously inspired by Dok Thul Executioner and his funny hat. Companion: Send Drone: This unit can summon Medical DRones, which continuously heal nearby allies. Heavy melee units designed to pummel enemies to death. They are very durable as well. Each attack of theirs can release a knockdown-inducing shockwave. They do have the Jetpacks, so they can be deceptively mobile. 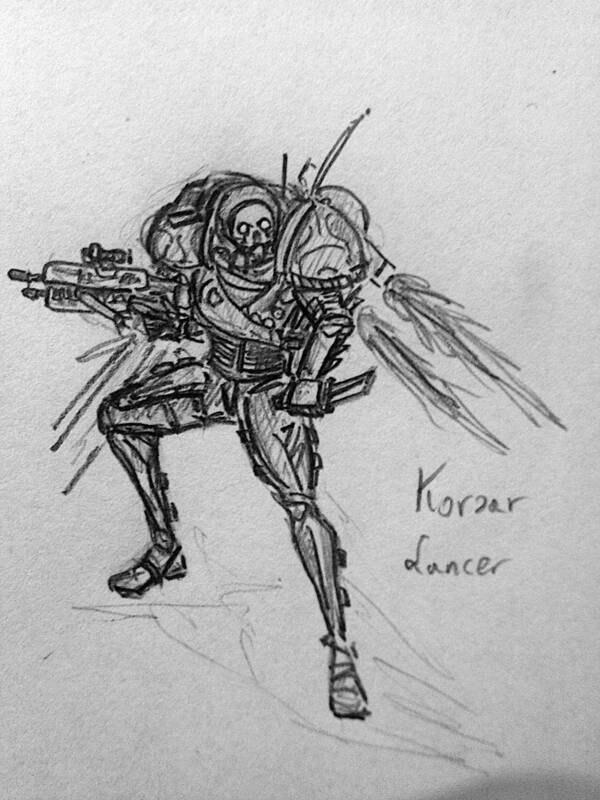 And finally... the Korsar Force Leader. The pinnacle of Grineer cloning tech. Regor's greatest achievement. 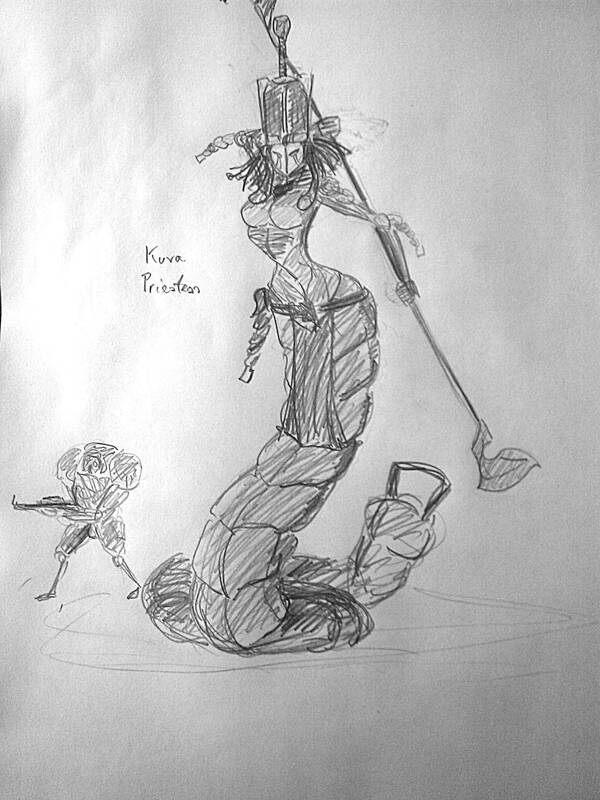 Krina is the leader of Shadow Marines. 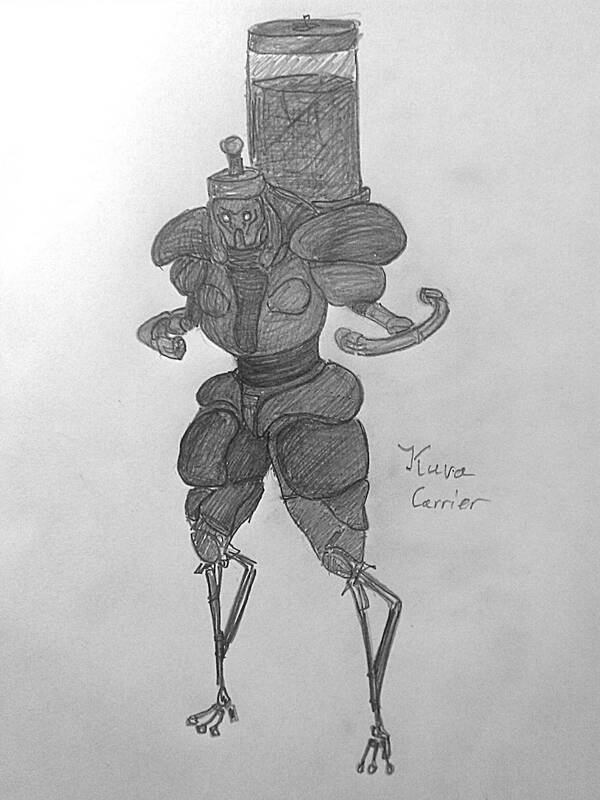 Specifically cloned from genetic material given to Tyl Regor by the Worm Queen, she is cut above all of her peers. 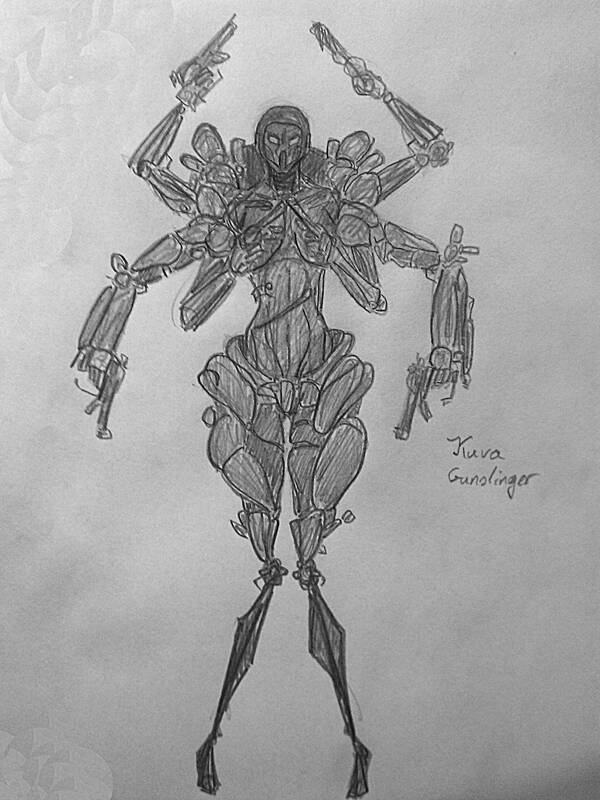 As a symbol of the Queens' authority, she was given an old Orokin weapon infused with Kuva, granting her the same Invulnerability as the Kuva Guardians possess. 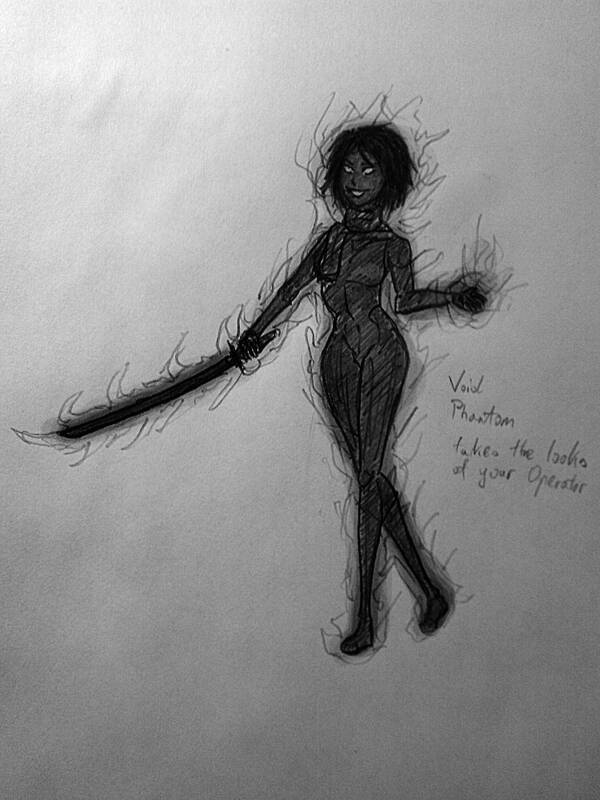 Void Dash through her or use Void Blast to force her to drop the sword. In Archwing missions, she will not Invulnerable, but will still use her sword to fight off melee enemies. Krina Hrokgar appears rarely with a dispatchment of Korsars in missions that meet all base requirements and are of level 37 and up. While her base level is 15, she will always spawn at level 50 or higher. She is essentially a boss-level unit. Innate: Kuva-Invulnerability: This unit is completely invulnerable and immune while wielding it's Kuva weapon. Void Dash will temporarily remove this effect. Ability: Ignis Firewave: This unit can fire waves of fire, which deal Heat damage to all units caught in the radius. Ability: Vulkin Barrage: This unit can fire a stream of bullets, which deal Physical damage to all units caught in the radius. 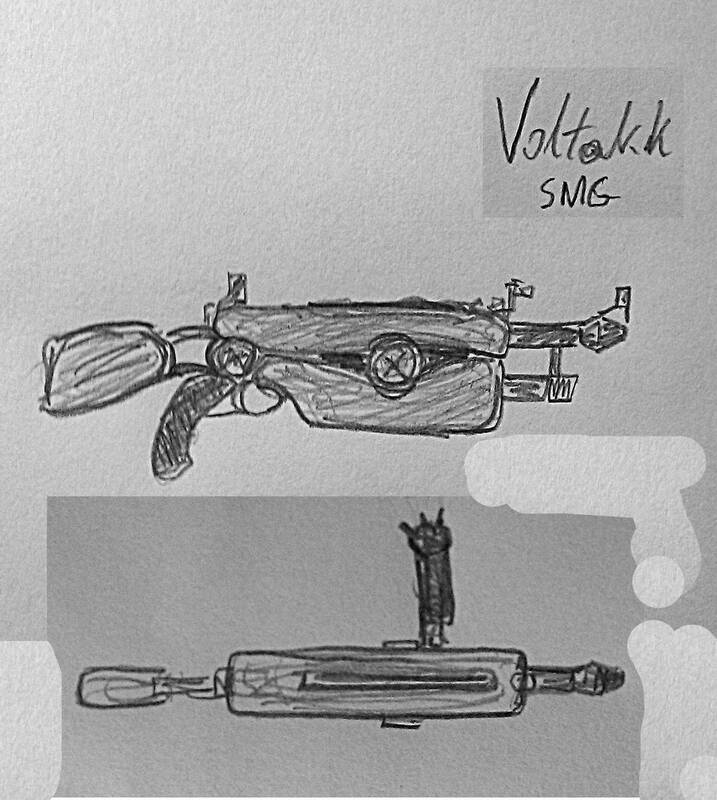 Voltakk is the standard weapon of the Korsar Marines, it was designed to deal heavy damage to Corpus proxies. An experimental energy core coats bullets in high-power plasma as they are fired, increasing their stopping power. Developed in secret by the Hrokgar Masterworks, like most Korsar weapons. Innate: Plasma Core: this SMG has innate Electricity damage added to the normal IPS. Fire rate and the base Electricity damage increase as this weapon is fired (10 rounds to achieve maximum bonus). Gains a chance to proc Magnetic regardless of damage composition of this weapon at maximum bonus strength. Sideways grip inspired by the British Sten SMG, the spiky ball at the end of that grip is the magazine. The "eye" in the middle is the electrical charge generator. 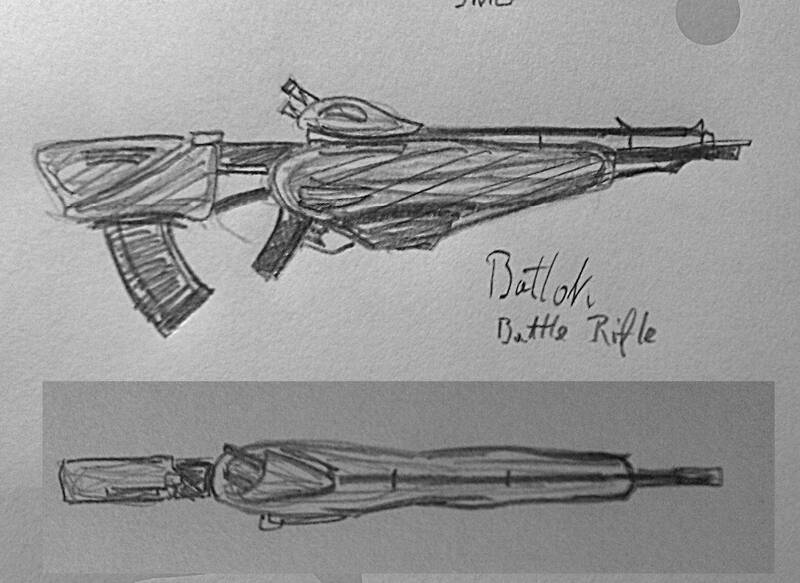 The Batlok rifle is a heavy-duty tool of destruction. Initially designed solely to punch holes in enemy ship hulls, the weapon found another use as a counter to newer heavy Proxy designs. Developed in secret by the Hrokgar Masterworks, like most Korsar weapons. Innate: Advanced Target Finder: while scoped in, enemies glow in the weapon's energy color (not just an outline, their whole sihouette would be marked), Punch-Through allows to see enemies through walls (up to the Punch-through value). Primary Fire Mode: Suppression Fire: Duplex Trigger, lower stats, higher fire rate. Secondary Fire Mode: Precision Fire: Semi-Auto Trigger, higher stats, infinite punch-through, 5 ammo per shot. A more powerful Argonak? Kind of, I guess. The Dwerg is a powerful 5-burst pistol. While unwieldy, it becomes a beast in steady hands. High ammo capacity and fast reload ensure steady stream of lead towards the enemy. Developed in secret by the Hrokgar Masterworks, like most Korsar weapons. Hind made into a pistol, kind of. Looks inspired by Han Solo's DL-44 from Star Wars. The cylinder in the middle is the magazine. When reloading, the whole thing pops out. This weapon is a conversion of the classic Hek design. Decreased amount of barrels tightens the spread, and added Pump-action increases stopping power. Each barrel has an independent magazine, which allows the weapon to fire in duplex mode. Developed in secret by the Hrokgar Masterworks, like most Korsar weapons. Innate: Double Mag: Reload can be interrupted in half to reload only one barrel. This disables the Duplex firing function. Looks inspired by SPAS-12, just way more bulky (like the Grineer). Duplex shotgun that doesn't have to reload every time is my dream weapon. If you ever found yourself needing more firepower, look no further. This is THE GUN. This quad-barreled rotary autocannon deals the damage. Just needs to be spun-up first. Innate: Rotary Engine: The weapon cannot be fired before achieving maximum spin. This weapon fires straight from reserves. Alt-fire: Spin-Up: Hold to ready up the weapon for firing; disables parkour while used. This precision semi-auto rifle was created to destroy enemy armour. It's stopping power is so high, that instead of having normal recoil it pushes the shooter back. Ammunition for this gun was first designed for orbital-station-grade weaponry. Developed in secret by the Hrokgar Masterworks, like most Korsar weapons. Innate: Ultra Recoil: Pushes the user back with each shot. Alt-fire: Modular Scope: Press while Scoped in to switch between a 2.5x/4x magnification. Not a sniper. Just a really big semi-auto assault rifle. Has low zoom normally, but can alt-fire to zoom closer. A replacement for the standard Sheev Palpatine, this mace is better designed to deal with shielded opponents. Innate: Energy Coils: This weapon has innate Electricity damage. Charge attack/Finisher: Magnetic Force: Guaranteed Magnetic proc on charge/heavy attacks and finishers. There is no small maces in this game (Silva Prime doesn't count). Also makes more sense to use an impact based weapon against a faction weak to impact (considering that most Grineer weapon follow this, it makes sense their melee would be the same). It's a machete, because a Kronsh Zaw with a short handle makes a machete-stanced mace. 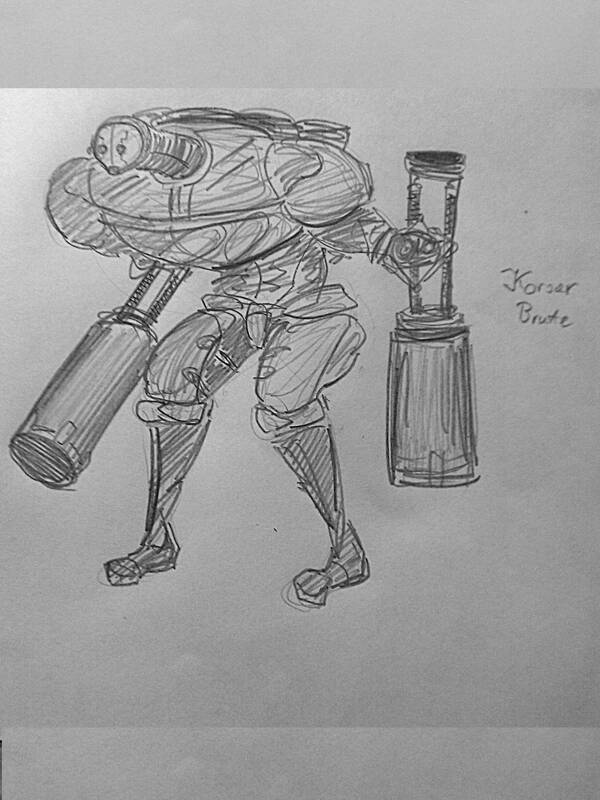 Description: This heavy jet-propelled design is based on the Grineer jetpack used by the Korsar Troops. Powerful defensive capabilities complement it's destructiveness. Creates a short-lived drone, which follows the player. All nearby allies gain bonus damage while the drone is alive. Toggles automatic defense turrets, which will destroy nearby enemy projectiles. Costs energy to activate and per projectile destroyed. Grants bonus armor and immunity to status procs and knockdowns. Each time a certain amount of damage is taken or a proc is neutralized, the bonus is decreased down to zero. Proc immunity is lost upon losing all armor. Fires a powerful round from the cannon, dealing massive damage in an area. Charge to increase damage and aoe. Blueprint obtainable from helping the Korsars out. Given in mail by Korsar Leader. Just to clarify some other things I didn't touch up on. 1. Korsars spawn in a single "wave" if they are eliminated, they won't reappear in the mission. 2. Regarding their spawn location, they will generally attempt to either spawn in next room closer to the objective than the players, or just teleport on top of the Tenno. 3. They will never be the first to attack the Tenno. However, they will instantly assault the player if they are attacked. 5. I'd imagine (based on details we don't know yet) that they could possibly spawn in Railjack, but that would be based on what level that mode will be. 6. The Korsar Teleport Beacon (image below) is a one-use gear item (blueprint acquired by helping out the Korsars a few times, just like the Archwing bp), which forces Korsar spawn in a mission that otherwise has met a the base requirements. 7. The Korsar use a new special Stealth Ship, the Manannan (image above)(named after Irish mythology guy with a Cloak of Invisibility, keeping with the theme of Grineer ships). This is mostly only lore-relevant though. It is around the size of a Firbolg and manned by a skeleton crew. It's role is to fire Teleport beacons at Corpus ships, which are then used to triangulate the position of them, when the Korsars decide to go say hello (violently). New Grineer Reinforcements coming soon, Tenno! Including: Grineer Bow (finally...), creative gunsmithing and heat-seeking missiles. And a very, very messed up gun. Three barrels of what is this even. Have you ever wondered what are some DELICIOUS ways to make protein slurry? Wonder no longer! Please report to your nearest provisions office for "education"
Use promo-code "W0RMB3STG1RL" for 100% off your first purchase! Introducing: Grinbau Explosive Bow, Nidlok Bolt Pistol, Misilok Portable Launcher, Kombinak... I'm not sure what it is to be honest... and the Brunink Heavy Machinegun! Grinbau is an exclusive weapon wielded by bored Nobles during occassional hunts. Sometimes the game is a wild, mutated animal, sometimes it's a squad of very unlucky marines. It's special functionality ensures the target dies, no matter what it is. 1. User puts the arrow against the center opening. 2.User pushes the arrow in, which locks it inside and activates a pump mechanism, filling the arrrow with detonite. 4. When fully extended, the locking mechanism opens (those thin antenna bits in front), and the arrow can be fired. Innate: Heavy Detonite Casing Arrows: Arrows need to be fully charged before shooting. Arrows do not explode on impact. Instead, they inject their contents into the enemy hit. Each "Detonite injection" grants the explosion bonus damage, flat bonus to crit chance equal to this weapon's base crit chance as well as increased aoe. Alt-fire: Trigger: Detonates all enemies tagged by the arrows. Once in a rare while a Tenno drops their weapon in the heat of battle. Be it due to actually being overwhelmed and having to retreat or just because of neglect, it doesn't really matter. What does matter is that those guns often times end up in the hands of the enemy, just like this Bolto conversion. The Nidlok is an example of the inexplicable ability of the Grineer to reverse engineer pretty much anything given enough time and samples. Innate: Grineer Tampering: This weapon fires at full auto. This gun is a "what if" about a Grineer gunsmith who found a Bolto. And then tampered with it to the near-breaking point. Description: Small and portable, the Misilok has gained popularity with the Urban-Warfare Troops, like the Drok Division, as it is much easier to use in tight quarters than the bulky Ogris, all the while still delivering a similar result. Likewise, it has gained notoriety amongst many rebels of the System as the "Nightmare Gun". Innate: Full Burst: This weapon fires all of it's payload simultaneously. Alt-fire: Lock-On Module: While Scoped, hold to lock on to targets, causing fired missiles to gain homing capabilities. The missiles will be equally split amongst all Locked-On units. Lock-On delay is affected by Fire Rate. A portable version of AT Ogris, which lets you decide who to chase around the map. Potentially dangerous to the user when engaging melee enemies. Be careful about the self-damage. 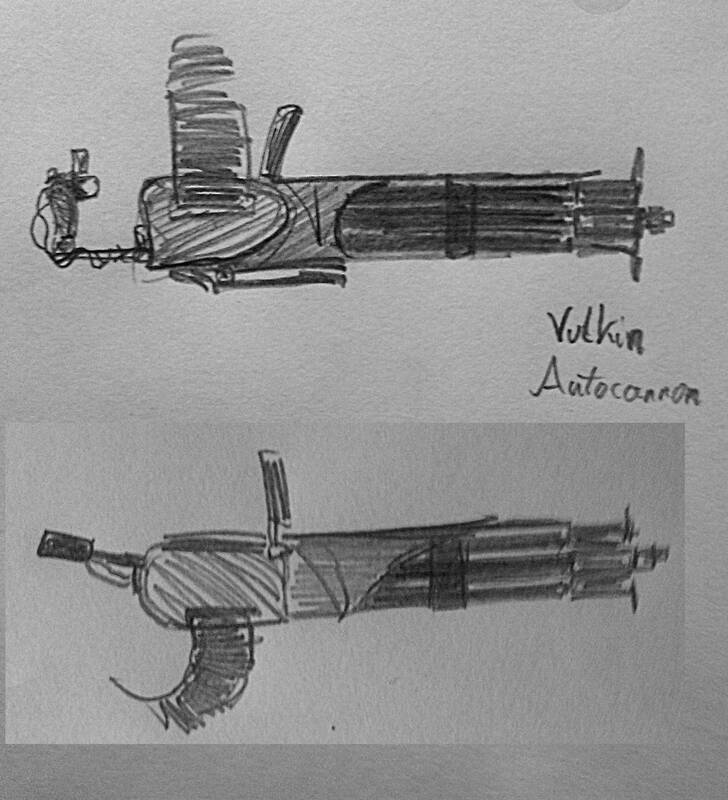 This weapon is a pet project of Horma Vamrak, an eccentric Noble and the head of the Vamrak Industries, which is infamous for creating many a weird gun. The Kombinak rifle uses a unique mechanical system to simultaneously feed rounds into 3 barrels. Hitting an enemy with all of them might prove to be quite a challenge however, as they rotate and move in random directions with each shot. Innate: Instant Burst: All shots in the burst are fired instantaneously. Innate: Spread Damage: Each shot in the burst carries a part of the damage, instead of each shot dealing the full amount. Each barrel fires a different type of projectile, one Impact, one Puncture and one Slash. Innate: Full Force: Hitting an enemy with all 3 bullets in one burst causes an explosion, dealing 300% of the weapon's damage. Can't find right now, but when I was looking through DE artists' Grineer weapon concepts on Artstation, I saw this three-barrel monstrosity, and decided I'd make it a thing. Changed the looks quite a bit though. This powerful Machinegun is extremely heavy and hard to control. Originally designed as a mounted, immobile emplacement, it was re-built after soldiers begun to rip them out of the mount to charge the enemy, when they could no longer fire at them from their previous fortified postions. Surprisingly, that worked pretty well. Alt-fire: Deploy Mount-Pod: Press to enter immobile stance, greatly increasing stability and handling of this weapon. Brunink = Browning machine gun. Doesn't really look the part, but the mechanics are there. An immense, dark fortress looms in the distance. It is too massive to be completely visible from this location. Countless Grineer galleons and corvettes are ceaselessly flying in and out of this behemoth of steel and rock. It's blood-shot, ever-searching eye suddenly turns, as if could look directly at a small vessel hidden between the asteroids. "On that day, the tenno have rebelled against their masters and ended the Orokin Empire. Even now they struggle against us. But did you really think you could kill me so easily, Teshin Dax?" Kuva Fortress has many secrets. The Tenno thought they had it penetrated and searched through after their daring escape from the Twin Queens. What they saw, what they fought through was just the outer layer. 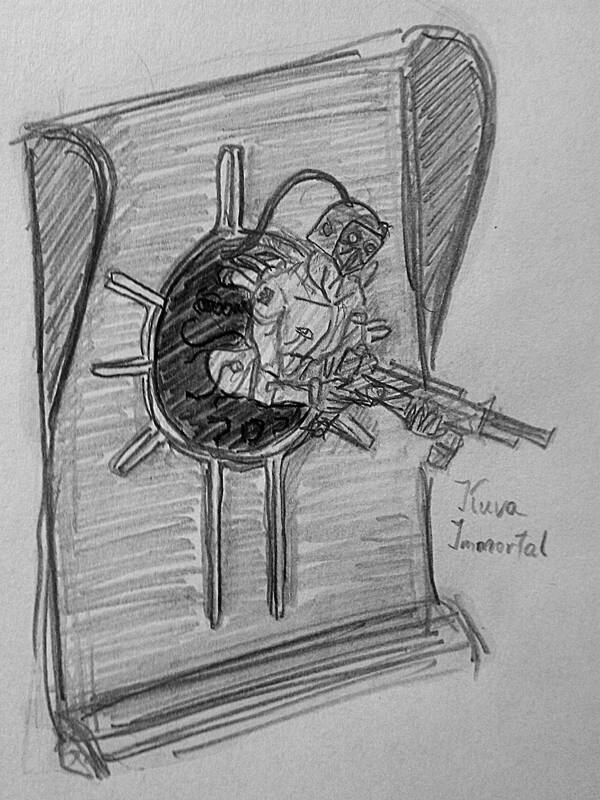 A glimpse of the true Fortress was revealed when they found the Kuva Harvester units and, blasphemously, took them for themselves. But the Inner Sanctum awaits. "Tenno, you are still just a child, prepare to be taught a lesson about good manners." Description: While at first glance, the Grinbau might seem as an inferior Lenz, it's unique stacking mechanic more than compensates for lower stats. The Detonite-infused arrows do not explode on impact. Instead, they inject their contents into the enemy hit. Each "Detonite injection" grants the explosion bonus damage, flat bonus to crit chance equal to this weapon's base crit chance as well as increased aoe. Use the secondary fire to trigger the explosion. Description: Full-auto conversion of the Tenno-made Bolto pistol. Fires smaller needles, which have higher critical potential, but lower base damage. Design notes: This gun is a "what if" about a Grineer gunsmith who found a Bolto. And then tampered with it to the near-breaking point. Description: Small and portable, the Misilok fires all of it's payload simultaneously. Using the scope (zoom) allows to Lock-On to chosen targets, which causes the missiles to home onto them. The missiles will be equally split amongst all Locked-On units. Reloads like Corinth/Zarr (except 2 rounds at the same time), can fire with mag not full. Be careful about the self-damage. Design notes: A portable version of AT Ogris, which lets you decide who to chase around the map. Potentially dangerous against melee enemies. Design notes: Can't find right now, but when I was looking through DE artists' Grineer weapon concepts on Artstation, I saw this three-barrel monstrosity, and decided I'd make it a thing. Changed the looks quite a bit though. Description: This powerful Machinegun is extremely heavy and hard to control. However, the telescopic tripod under the barrel can be extended with alt fire to greatly stabilize the gun, at the cost of becoming immobile. Perfect for holding tight corridors or mowing down enemies from elevated position. Design notes: Brunink = Browning machine gun. Doesn't really look the part, but the mechanics are there. Ah, the bow seems to be a reasonable piece of kit as far as I can tell. Tempted to suggest an increased fire-rate and a decreased damage output to "let the pay-off actually happen", but, you seem to have things set up and layered with establishing concrete. Well, seeing as it is a bow, all fire rate mods affect it with double power. Didn't want to overdo the speed, as it could make it kind of ridiculous. One thing I suppose I should add, is that the bow needs to be charged fully to fire. No half-charged shots. Ah, a need to prime the injection pump by giveing it a full draw, I can see that. Otherwise, it's like throwing a heavy glass container filled with liquid at someone with a hypodermic stuck on the end. I can get behind that aspect. The Inner Sanctum is meant to be endgame. Prepare for 3rd Sortie-tier levels, difficult minibosses at every turn and heavy usage of the Transference. The requirements for unlocking this new area of the Kuva Fortress are also somewhat intricate. So here we go. 1. Reach Mastery Rank 10. This one is simple enough. Ensures you have adequate equipment and understanding of the game. 2. Clear all currently (as of the time of writing this post) available quests. If somehow you didn't do that yet. Ensures plot continuity. 3. Acquire 10000 Kuva (not a career total, must have it all in the inventory) as well as have cycled a Riven mod at least once (that part should be easy though). Ensures you have the resources you will need. 4. 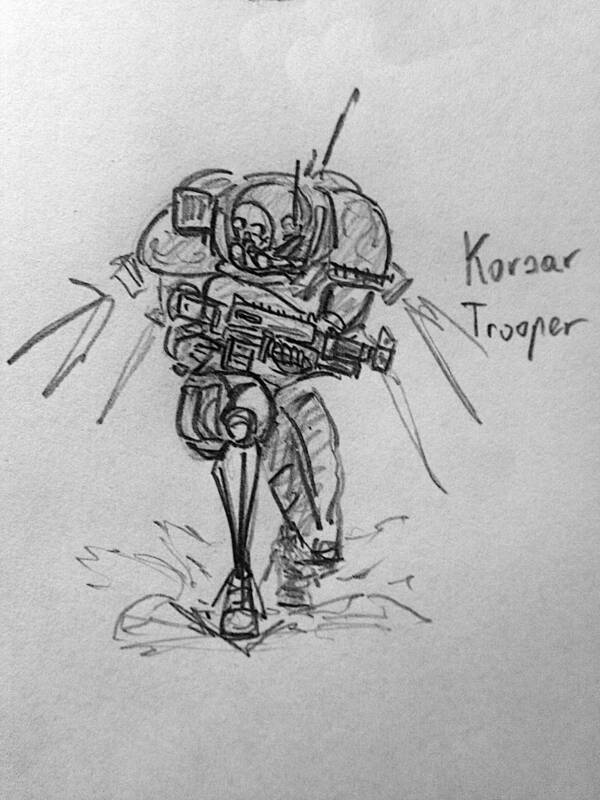 Acquire the Korsar Teleport Beacon by helping out the Shadow Marines (see Part 1 of this thread) and use it at least once. Ensures plot continuity. 5. When all of the above is done, the player will be contacted by Krina Hrokgar (Korsar Leader). The message will unlock a new quest, "Corpus Omega-Proxy". "Hey Tenno, I know it might seem weird to ask you for help, but we fought together before. Here it goes: We got some intel on a brand new Corpus proxy being built. It's big, really big. This message got the coords, if you think you could come and hang out." 6. After the quest completion (more on that below), the player will be messaged by Teshin. This transmission will also unlock the Inner Sanctum's first mission node (connected to Taveuni, Kuva Fortress). It will also PERMAMENTLY increase base level of all Kuva Fortress missions to 50-60 as well as introduce permament alert level system to them (again, more on that below). After the message from Krina, a quest node on Pluto will become available. The mission is a Corpus Ship Assassination, with it's target being the mysterious Omega-Proxy. When the mission starts, the player will be contacted by Krina, who will lead them towards the target. No enemies will be present at that point. After reaching the boss arena, the player will be ambushed by a great number of Kuva soldiers, including multiple Guardians and Jesters. Krina: "Sorry, Tenno. But you got something we need and asking politely just wasn't an option." Ordis: "Operator?! The Grineer! They are on the Orbiter! THESE BLOODY-*static*"
After fighting off the Kuva forces, the player will return to the Orbiter, only to find that nothing really changed. Except, the Vitruvian device (acquired during the Sacrifice quest) is gone. This discovery prompts the aforementioned message from Teshin. Teshin: "Tenno, you were made a fool. There is no saying what the Grineer could do with Ballas's knowledge. Thankfully, I know where they took the Vitruvian. It's the Kuva Fortress." Operator: "Well, it shouldn't be too bad then. I've already raided that place multiple times." Teshin: "There are things you still don't know about that place... I... You need to be careful Tenno. The enemy has only grown in power since we last fought them." This completes the quest, unlocking the Inner Sanctum's first node, the Hall of Greetings. Entering this mission requires 500 Kuva every time (although Kuva can sometimes be acquired inside). Next nodes will be unlocked later, each with their own requirements. As mentioned before, a special system becomes active in all Kuva Fortress missions, obviously including the Inner Sanctum. Inspired by the Alarm Level mechanic showcased during the Fortuna sneak peek, Kuva Fortress has multiple stages of Alarm. Once a stage has been reached, however, it can only be reverted once. After the same Alarm level has been raised again, it cannot be hacked away. The Fortress hates uninvited guests. Door lockdown happens every 2 Alarm stages and can always be disabled via hacking. In addition to increased enemy spawns and levels, the Alarm levels can attract different, powerful enemies. 1. Normal effects of a raised alarm. 2. Door lockdown, spawns large force of enemies in a room close by. 3. Guaranteed Heavy Unit Eximus dispatchment spawn (teleports to next room, or even on top of the player). 4. Door lockdown, spawns large force of enemies in a room close by. 5. Guaranteed Kuva Guardian and Jester spawns, from now on these units can spawn normally in the level. 6. Door lockdown, Heavy Unit Eximus dispatchment spawns on top of the player, led by a Kuva Guardian and Jester. 7 (and every odd level from now on). Kuva Bombard Eximi now spawn periodically on top of the player's location (each Alarm level adds another Bombard). 8 (and every even level from now on). Door lockdown, Kuva Guardian Eximi (Yes.) now spawn periodically on top of the player's location (each Alarm level adds another Guardian). Reasoning for the changes: This makes the Fortress truly feel like the heart of the Grineer empire. You don't go in and do whatever you want for as long as you want. You go in, and attempt to get out as fast as possible. 1. Kuva Executioner and Kuva Assassin duo deployed against the player. 2. Door lockdown, Kuva Executioner and Kuva Assassin duo deployed against the player. 3. Kuva Executioner Eximus and Kuva Assassin Eximus duo deployed against the player. 4. Door lockdown, Kuva Executioner Eximus and Kuva Assassin Eximus duo deployed against the player, the Void Phantom starts spawning rarely. 6. Door lockdown, the Void Phantom appears more often. 7 (and every odd level from now on). Kuva Carriers appear more rarely in the mission, the Void Phantom appears more often. 8 (and every even level from now on). Door lockdown, Kuva Carriers appear more rarely in the mission, the Void Phantom appears more often. Hall of Greetings will be described when I make all the artwork and iron out the mechanics. That is yet to be completed. 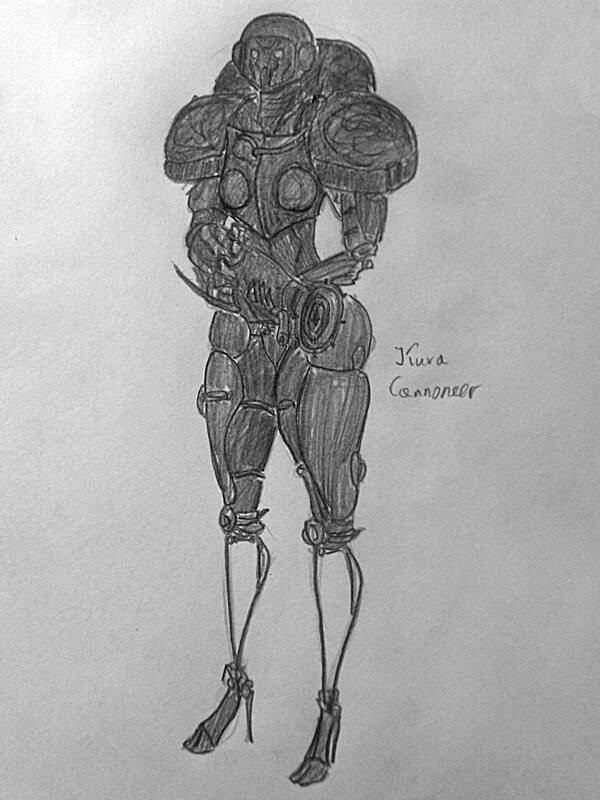 In the meantime, here is some more Kuva units. Heavy melee units designed to pummel enemies to death. They are very durable as well. Each attack of theirs can release a knockdown-inducing shockwave. 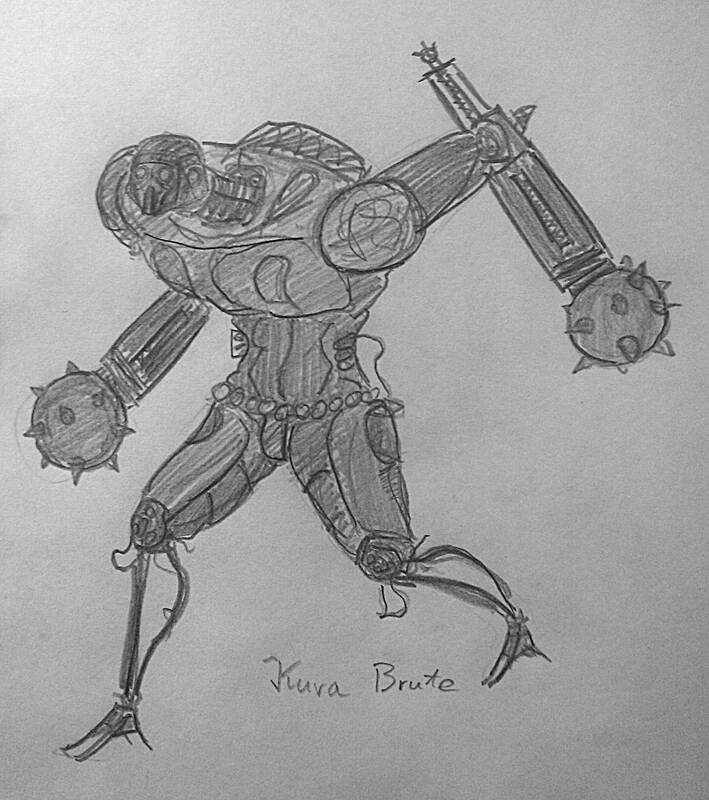 This Kuva variant have hydraulic-piston-powered weapons, which allows them to strike at considerable range. They can also employ a deadly spin attack. These soldiers are equipped with the Target-finding Argonak rifles, capable of attacking enemies both close and far. When alerted to Tenno presence in the area, they will periodically sweep their surroundings, revealing any nearby invisible units. They are also capable of highlighting their target for all other Grinner to see and focus fire, whenever you hear an Argonak fire, expect more shots to follow. Huntresses never hunt alone, always spawning together with at least one friend. Innate: Target-Paint: Nearby Grineer are more likely to focus on this unit's target. 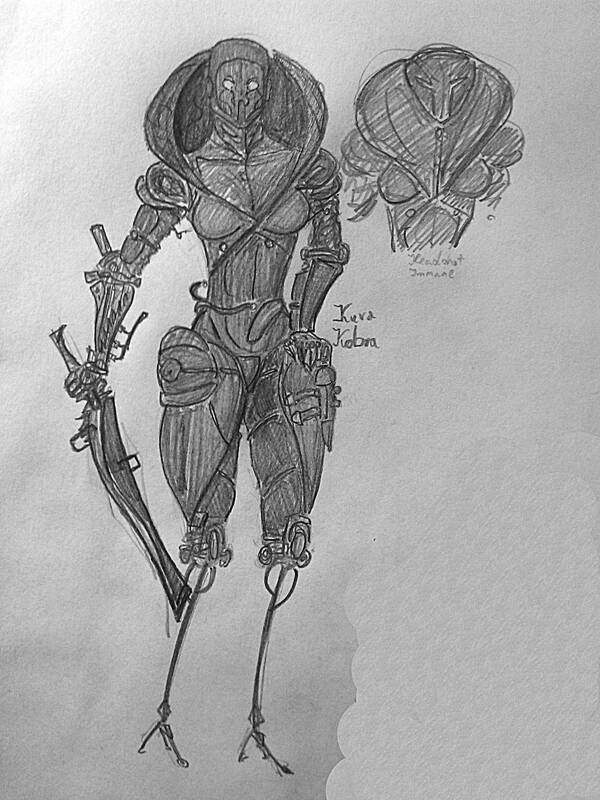 Innate: Cloak-Vision: When suspicious or alerted, this unit gains True Sight. These Kubrow-like proxies are the result of Grineer canibalizing Corpus tech into their own designs. Carrying a sensor camera as it's head, they can easily detect unwary Tenno, instantly raising map-wide alarm when they do. When alerted, they will deploy their Missile Launchers, normally hidden inside of their would-be stomachs. Similarly to Rescue Mission-exclusive Warden units, the Sensor Proxies take greatly increased damage from stealth finishers and reduced damage otherwise. 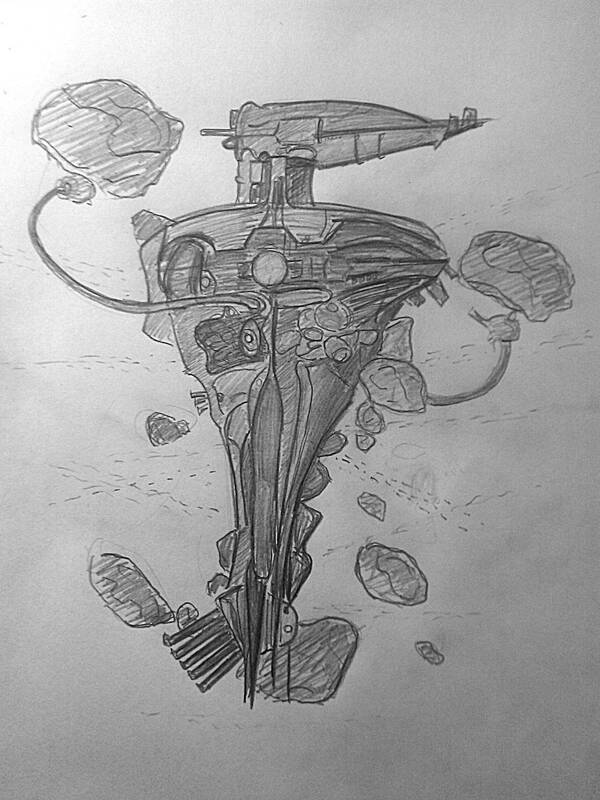 Innate: Scan Area: This unit is equipped with the same scanner as the immobile sentry turrets. The armor of these hardy melee warrior was specifically designed to mock the honorable Dax soldiers of the Orokin Empire. 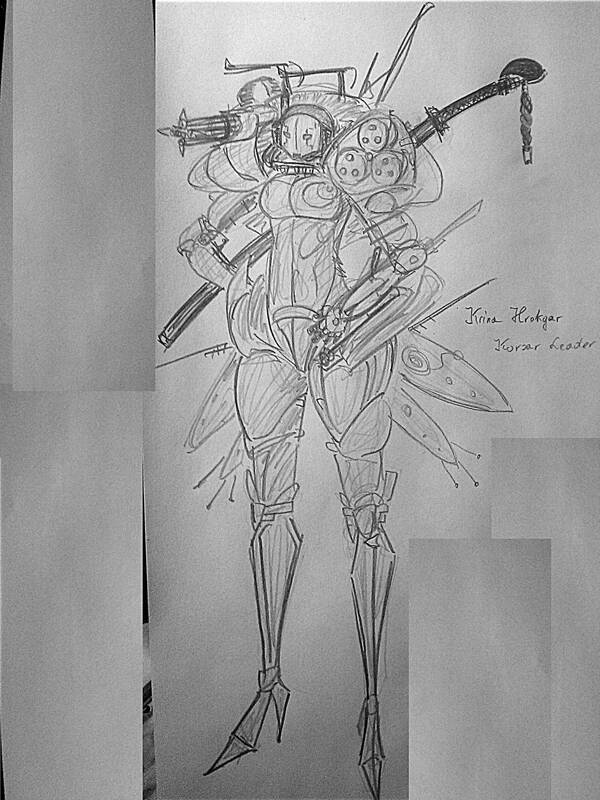 Wielding Grineer-made imitation of the Nikana, dubbed "the Grinkana", they can slice right through their enemies. If one tries to evade their melee strikes, the Daks can throw their Glaives and even detonate them mid-air, dealing Blast damage with a guaranteed knockdown. 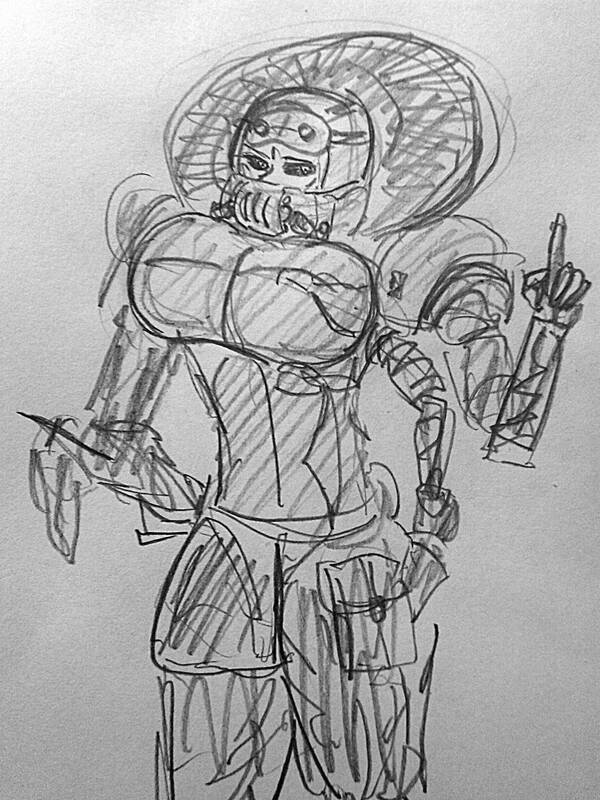 They are also the only explicitly-male Grineer unit to be allowed inside the Inner Sanctum. Ability: Slash Dash: This unit can dash between enemies while slashing with their weapon. That's it for now, but stay tuned for more Soontm. It's time. This is just the beginning, Tenno. 1. As said above, entering any Inner Sanctum mission costs [500*Mission tier] Kuva. This has to be paid by every player in the party. 2. In the Sanctum, no male Grineer, apart from the Kuva Daks and Kuva Vor, can be found. Yes, this means yet more units are coming. 3. Inner Sanctum uses a variation on the Grineer Asteroid Fortress tileset (called Asteroid Fortress Hidden), with new rooms and traps. No archwing tiles exist within this tileset. 4. Teshin replaces Lotus-Ordis for these missions. A unique mechanic tied to the Permament Alarm System (read in posts above) is the Void Phantom. When reaching a certain Alarm level inside the Sanctum, the Phantom gains increasingly high chance to spawn ever so often. When appearing, it will taunt the players directly. The Phantom is completely INVULNERABLE AND IMMUNE TO ALL CROWD CONTROL. It will despawn after some time has passed. While unkillable, it cannot directly damage the players, it's attacks can only cause stagger. However, when in Operator mode, the Phantom may attempt to possess the player's Warframe. When that happens, the Operator is instantly recalled and multiple Transference Static procs is applied, these have no cap. Umbra Warframes can only be possessed when their hp has been depleted. Kuva Immortals are Inner Sanctum specific traps that fill many rooms in the tileset. These warriors of old are strapped into the walls of the Sanctum, forced to defend it for eternity. When alerted, they will instantly raise Alarm level and engage the player. When killed, they will be revived by an automatic electro-revive system after a delay. This cannot be stopped. Their life support system cannot be destroyed. The following units can only be found inside the Inner Sanctum. This female Bombard variant sports the high damage Zarr as it's weapon of choice. They will make use of both fire modes, depending on the circumstances. They can also teleport around the level. 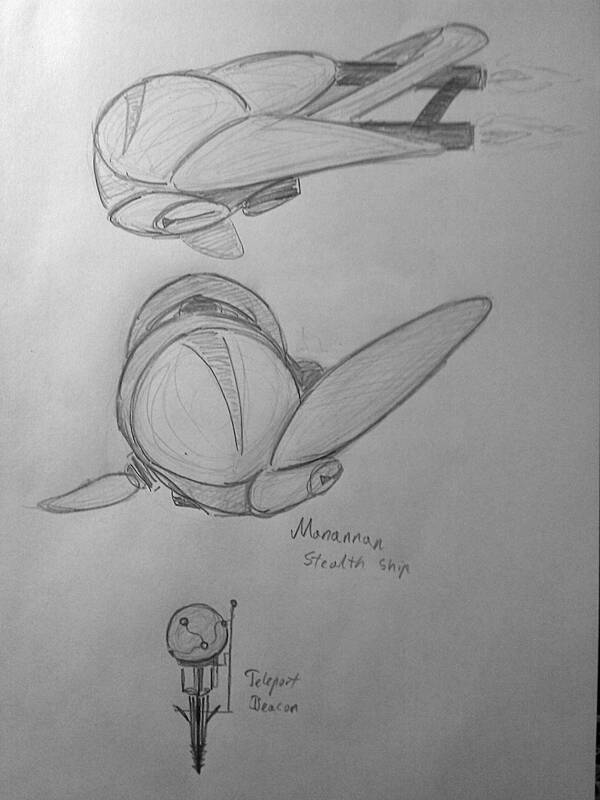 Movement: Teleport: Using their Teleport Gear, this unit can quickly reposition themselves, gaining damage reduction on certain frames of the animation. Kobras are incredibly dangerous melee combatants. 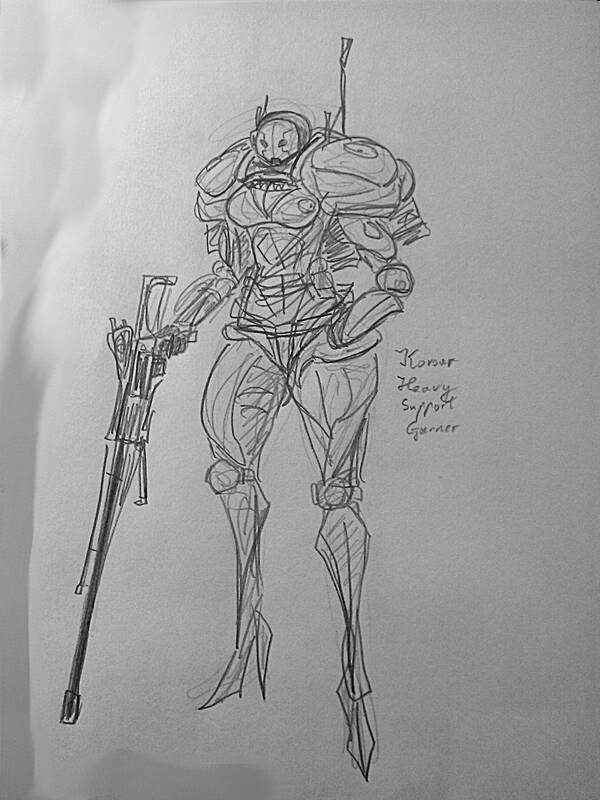 They possess heavy head armor, making them immune to headshots, until it is blown off by damaging their back enough. Their blades deal consistent Slash and Toxin procs and bypass shields entirely. 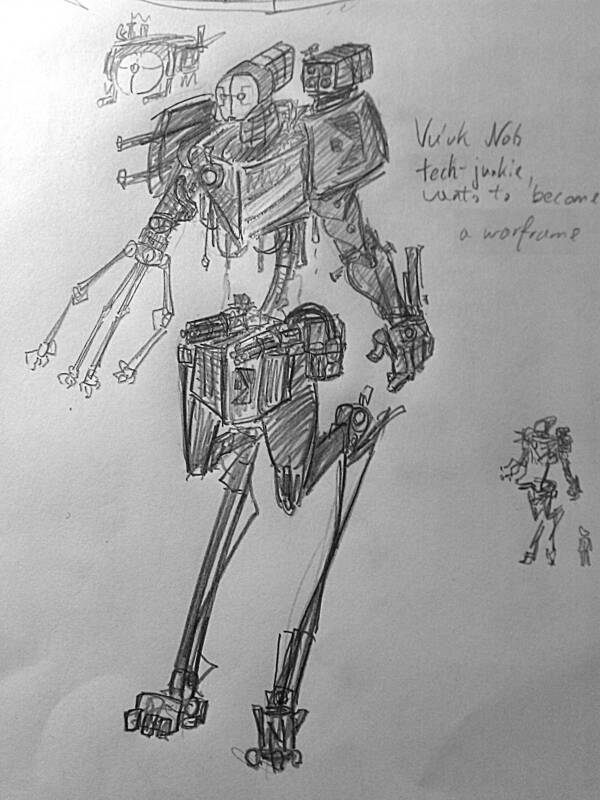 Using a special jet-powered arm augmentation, they can unleash a flurry of attacks at moments notice. Innate: Head Protection: This unit is immune to headshots until the cover is destroyed by attacking their back. Melee: Flurry: This unit can perform several attacks after each wind-up animation. Ability: Ripline: This unit can fire a hook, which will reel in any target hit. Wielding six Mareloks, these markswomen have greatly increased accuracy at all times. Given enough time to prepare, they can enter a Peacemaker-like stance, where they can obliterate even the hardiest of foes. Ability: Peacemaker: This unit can enter a channeled state in which they will gain 100% accuracy, rapidly increasing fire rate and greatly increased damage. The powerful Executioners are invulnerable to damage just like the Kuva Guardians. In order to remove this effect, all of the Kuva Flasks embedded in their armor need to be destroyed using Void damage. The Flasks periodically extend out of the Executioner's armor after certain heavy attacks. The amount of Flasks on a given Executioner increases with their level. The Executioners possess the ability to teleport at will using a void key, just like Captain Vor. Innate: Kuva Flask Invulnerability: This unit possesses several Kuva Flask which grant it total invulnerability and immunity. The Flasks can be destroyed with Void damage. The Assassins hide in the shadows and wait for the Tenno to fall. Once a Warframe is downed, they will quickly attack them, killing the player instantly. Knocked down players will be subjected to high damage ground finishers. They are also invulnerable until all Kuva Flasks, hidden inside their armor, are destroyed with Void damage. The Flasks are revealed periodically after certain attacks. Movement: Smoke Bomb: Using their Smoke Bombs, this unit can become Invisible and quickly reposition themselves, gaining damage reduction on certain frames of the animation. Melee: Finisher: This unit can perform finishers. The Marshall is a paragon of the Grineer. They possess great skill with their chain-sword and are able to attack very quickly. When the enemy attempts to make distance, they will follow with a Teleport or simply Blind them. The Marshalls can execute downed Tenno, killing them instantly. They are also invulnerable until all Kuva Flasks, hidden inside their armor, are destroyed with Void damage. The Flasks are revealed periodically after certain attacks. Ability: Radial Blind: This unit can unleash a flash of light, blinding all enemies looking at it. Companion: Summon Reinforcements: This unit can summon random Kuva Grineer units, whenever it wishes. 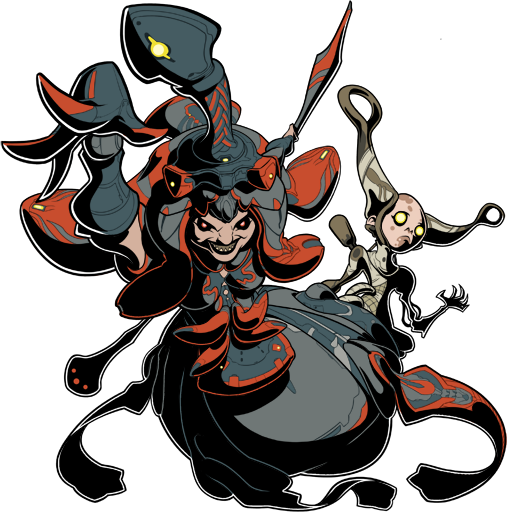 Due to the nature of the Inner Sanctum, most enemies encountered there are the elites of the Grineer. Basically every encounter can feel like a mini-boss if the player is unprepared. Next time: Kuva Vor and Hall of Greetings explained (finally). As mentioned before, entering costs Kuva (500 x Mission Tier, where Mission Tier is equal to the unlock order). An additional Quest mission will be unlocked after defeating the Yuvan Theatre's boss a few times. Stay tuned I guess. 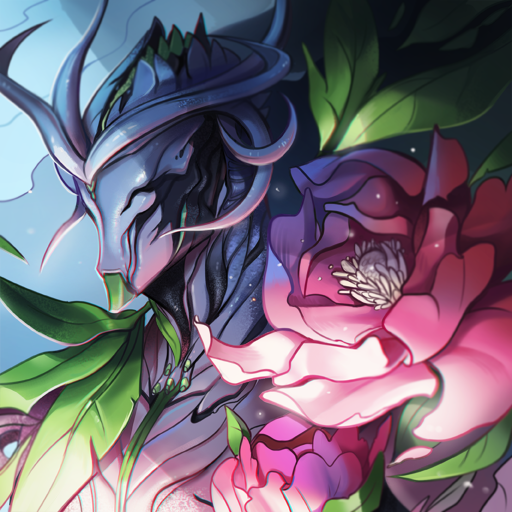 It may or may not involve truly killing an Orokin. The Carriers are non-combat units that move Kuva supplies around the Inner Sanctum. When engaged upon, they will attempt to teleport out of the level. If the player can kill them before that happens however, they will be rewarded with a small amount of Kuva. Ability: Disappear: This unit can despawn if left unchecked. The nearly completely unmodified Blademistresses are proud Nikana-wielding warriors. With a multitude of fast attacks and movement options, they can fight with the Tenno as equals. Movement: Parkour: This unit can use all the parkour available to the players. 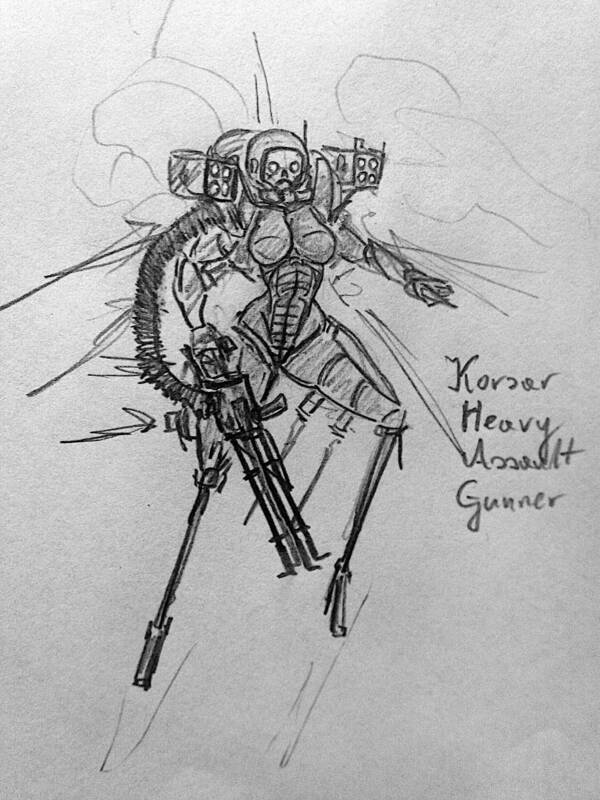 Replacing the Napalm units, the Hellchariot is a one-woman-army. Small secondary augment-arms hold additional weaponry, which the Hellchariot uses while either bombarding the enemy with high-power fiery explosions, or dashing into melee with her greatsword. 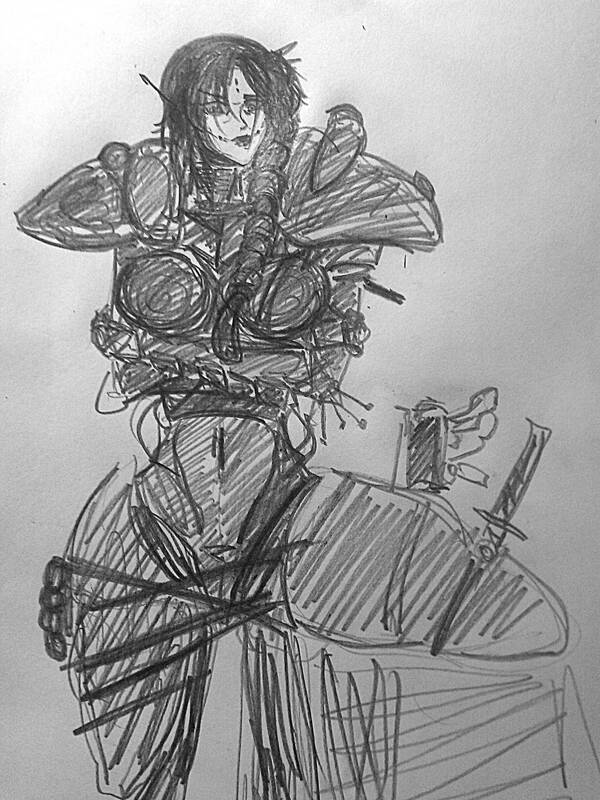 Additionally, her heavy helmet decreases the headshot bonus damage. Melee: Fire Shockwave: This unit can smash the ground to knockdown all nearby opponents. Procs Heat status effect. 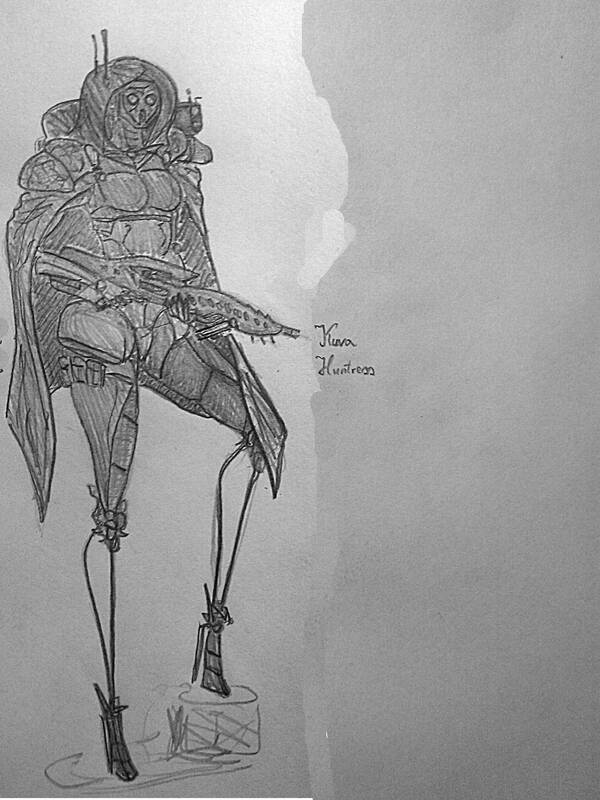 Having come back from the Void, Vor is once more the Queens' loyal servant. And he brought gifts. A small detachment of converted Corrupted troops always spawns with Vor, who will appear himself whevener Alarm of level 5 is activated. Vor was given Kuva-invulnerability just like the Guardians have, but he is faster to regain it. Ability: Nervos Mines: This unit can deploy Nervos Mines which continuously shocks nearby targets and sap their energy. 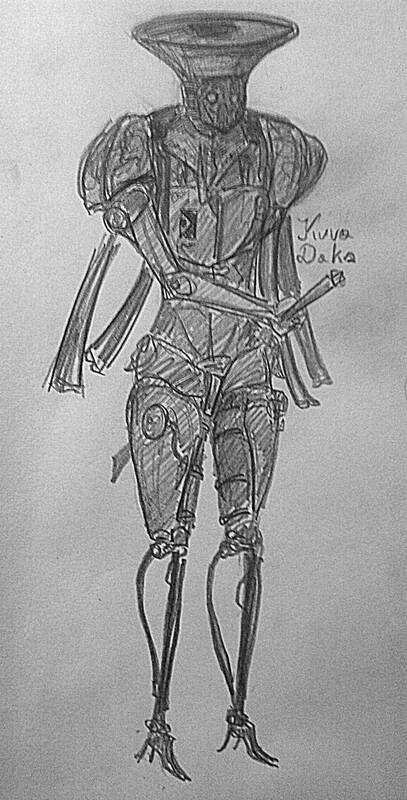 Ability: Kuva Seeker: This unit can fire homing Kuva projectiles, dealing True damage. Ability: Kuva Eruption: This unit can erupt several Kuva Pillars that deal continuous True damage. Fast post to clarify the Kuva Flask mechanic possessed by multiple units I've previously shown here (e.g. 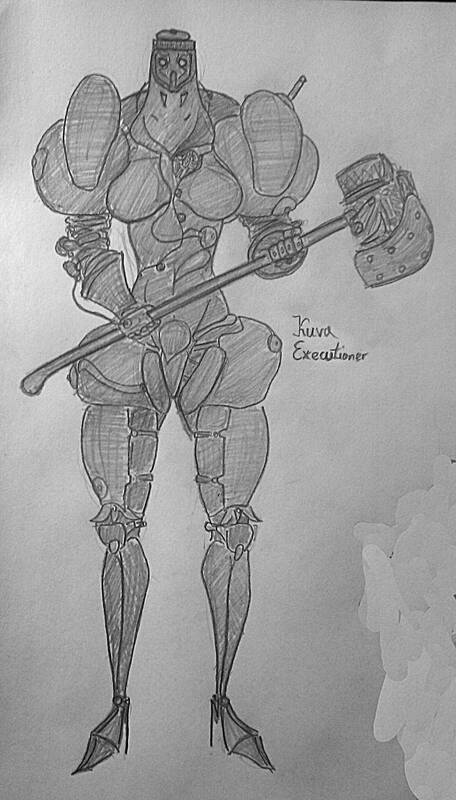 Kuva Executioner). Reminder: As long as a unit possesses a Kuva Flask, they are invulnerable to damage and resist all crowd control applied to them. 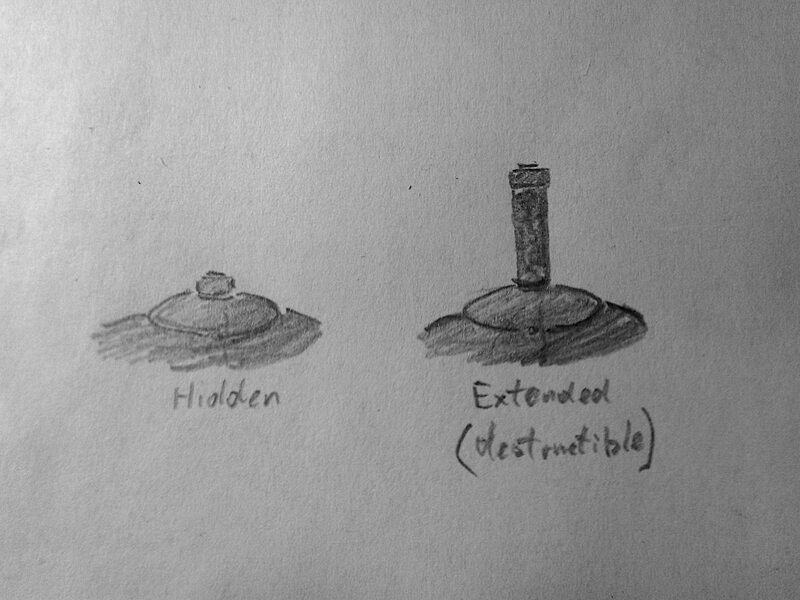 As seen on the picture, the Flasks can only be destroyed when they are extended (this happens periodically based on certain attacks and abilities used by the enemy in question). The Flasks can only be damaged with Void damage. Enemies generally have multiple Flasks on their armor, however they do not regenerate, so after destroying all of them, the unit will not regain their invincibility. Coming soon: new Grineer Reinforcements! Flarkan Flare Gun, Grikrat SMG, Leviathan Battle Rifle, Grinkana, Toksilok Sniper Rifle, Shrap Grenades, Koilok Energy Weapon and, last but not least, the Gustof DMR. Flarkan fires highly explosive flares. It is used by Grineer squad leaders to pick out priority targets or call reinforcements. 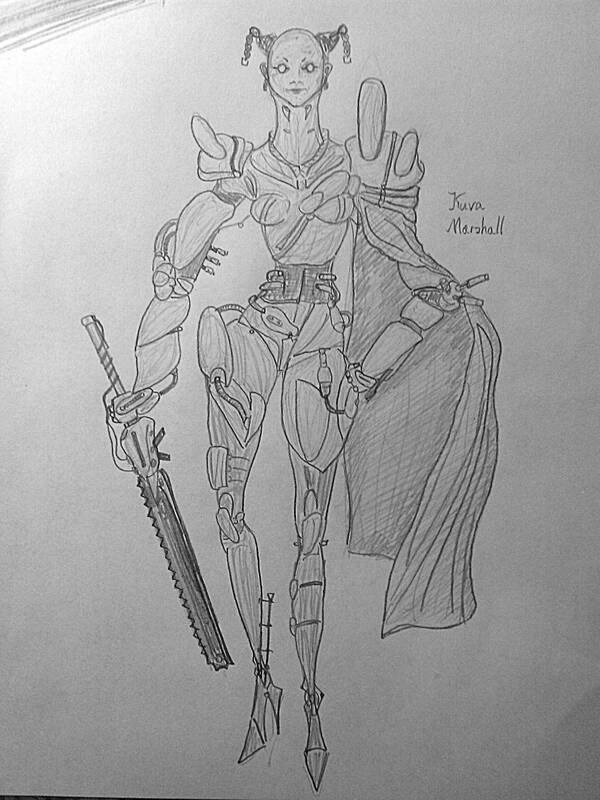 A timeless design based on Old Earth weapons. Innate: Signal Flares: Enemies directly hit by this weapon's projectiles are revealed and suffer from 50% increased damage from all sources. Impact damage is dealt only to directly hit target. The flare explodes on impact with enemies or terrain. This streamlined Grakata variant possesses variable firing modes, allowing for greater accuracy and power over longer range. Default full-auto retains the familiar feel, while added 3-round burst mode deals more focused damage to priority targets. Designed by the Arno Harkonar as his first display of genius. Meant to be Prisma Grakata's sidegrade, this gun is probably what you would want to get if you enjoyed base Grakata in the early game. Alt-fire to switch fire modes. This heavy battle rifle is an evolution of multiple Grineer weapon technologies. State of the Art trigger mechanism design combined with unique scope system make this rifle stand above. Equipped with the same Target-Finder technology as the Batlok as well as an under-slung Incendiary Shell Launcher, this is not a gun for basic grunts. Alt-fire: Underbarrel Incendiary Shell Launcher: Fires a fiery HEAT projectile. Get it? I like burst weapons, I like duplex weapons, so this is a duplex-burst gun. With added grenade launcher (uses 16 ammo per nade). Alt-fire shoots the nade instantly instead of switching fire modes. 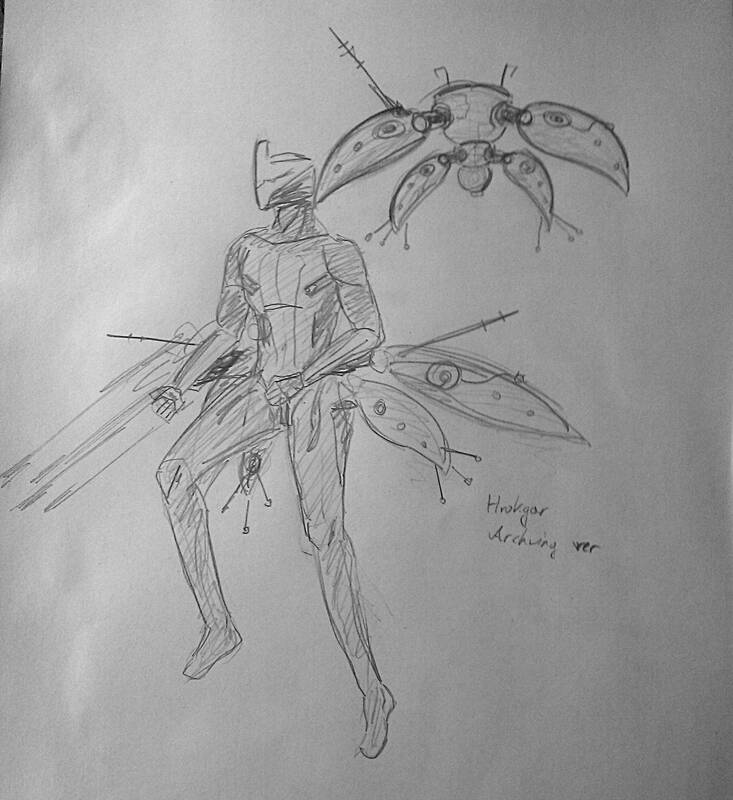 Grineer trying to feel hip and cool enjoy using Orokin/Tenno-like weapons. This is one of them. 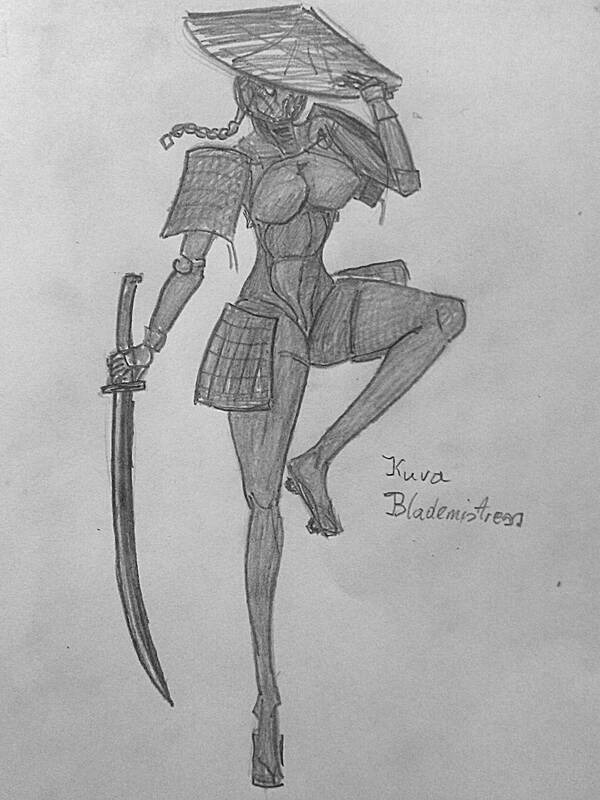 It is also the traditional sword used by Kuva Daks soldiers. Charge attack: Bloodletting: Guaranteed to proc Slash. 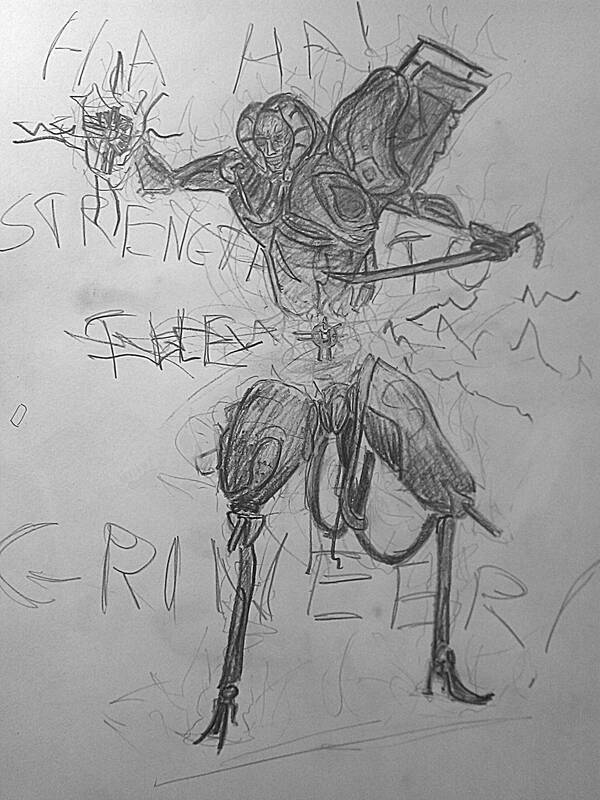 A Grineer nikana. Fast and simple. 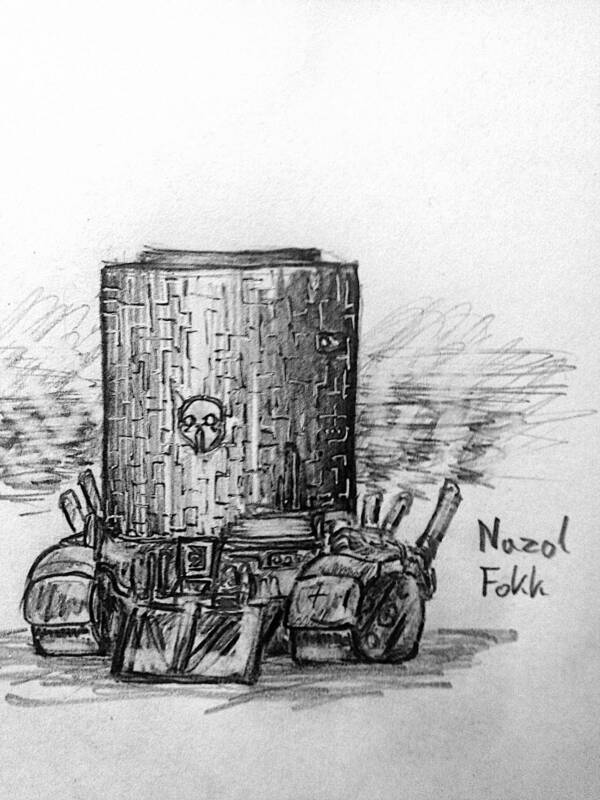 Using unique "wet can"-type silencer, the Toksilok is completely supressed. Toxic ammunition it fires behaves like it's smaller brother's, Acrid's. As a bonus, enemies killed by this weapon cannot scream, due to their vocal cords/systems being melted. This is a lethal, inhumane assassination tool. Innate: No Escape: This weapon is completely silent, procs Toxin on every hit and disintegrates killed enemies instantly. Acrid as a sniper rifle, kinda. These shrapnel grenades are perfect for clearing out closed spaces and dealing with Infestation. When they explode, a large amount of small metal blades damages everything around. Innate: Shrapnel: This weapon releases deadly projectiles on detonation. Charge: Hot Potato: Hold to "cook" the grenade. I feel like thrown weapons are too stale with "different type of throwing knife". We have electric castanas. So, let's have actual frag grenades. Beware of self-damage. Description: Powered by a strong electro-magnet, the Koilok can fry enemies with pure energy. Due to the need for a closed circuit, this weapon only fires when the aiming reticule is on an enemy. Innate: Short Circuit: This weapon can only fire if there is an enemy in it's range. An "auto-trigger" gun. It's inherent "cheatiness" is offset by the fact it's not actually that super powerful and has a pitiful range. Description: Gustof is a powerful hand cannon capable of breaking through heavy armor. Originally made as a gift by Gaud Krupp for Ela Drakkar, one of the Grineer High Councillors, it's design has proven exceptional during her hunting sessions. She enjoyed the weapon so much that she ordered weaker copies to be given to her loyal Widowmakers. Innate: Heat Dissipation Shroud: This weapon briefly decreases Heat resistance of all nearby units (including the user) by 16.66% per bullet loaded (additive, or rather subtractive*). Alt-fire: Super-Combination Chamber: This weapon can fire it's shots individually, or, by using a unique lever action, load up to 6 rounds to fire them as one (combining their base stats** into a single, powerful bullet). "Choose your firepower" the gun. Either really strong, or absolutely overkilling everything. *Say a dude has 50% resistance to Heat, with all 6 bullets shot he has -50% now, etc. **Yes, this means 4 shots combined have base 100% status, as well as 6-combined shot having 300% base crit chance and 15x multiplier. It takes 6.6 seconds (6 times the reload, obviously) to load all the bullets. There is still quite a lot of coming though! Making progress on the Nobles' designs. These four will lead the Grineer inside the Inner Sanctum. When starting a mission, one will be randomly chosen for the players to fight, each with special units and tactics. Each time the Inner Sanctum is entered, a single Noble House will be chosen from the available pool (starting at 4, but I might add to it later). Houses possess unique units, abilities and tiles (I will elaborate on those in further posts, for now I'll namedrop a lot 😉 ), which only appear when fighting the specific House. For easier recognition in battle, each House has a main color, which replaces the normal Kuva coloring of all units in the mission (including generic Grineer units not exclusive to any House). House Motto: "Take what is Yours, make Yours what is Theirs"
1. "Let the Hunt begin!" House Motto: "Even the Dead shall not Surrender." 2. "Our Bodies as a Shield"
3. "Ready for a Sacrifice"
House Motto: "To be Grineer is to be Greater." 2. "Veneration of the Womb"
House Motto: "The Stars, they are the Grineer Empire." 3. "Our Sisters, Our Mothers"
Each House will have it's own post, for easy access, when I make an actual table of contents. This is awesome! If even one thing from this was added to the game, I'd be SO HYPED! (Get on that DE!) Anyway, good job on this, it's amazing!